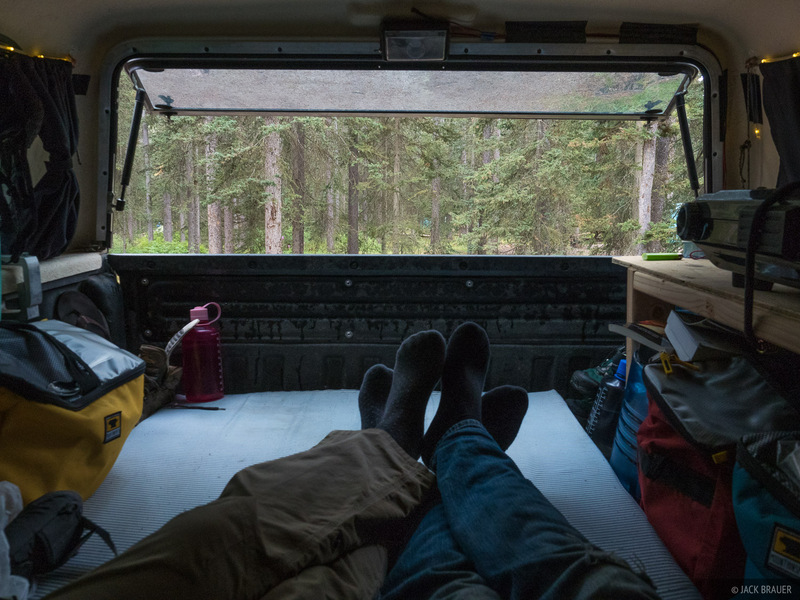 In June 2016 my wife Claudia and I took off on a summer-long road trip. 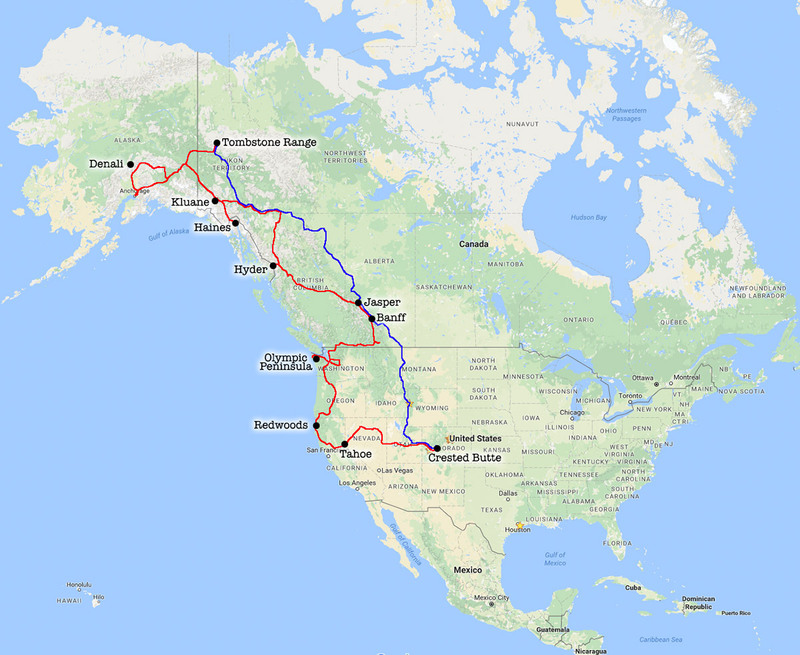 Over the next 3 months or so we drove over 12,000 miles (19,000+ km), from Colorado to Nevada, northern California, Oregon, Washington, the Canadian Rockies, Yukon, Alaska, and back. 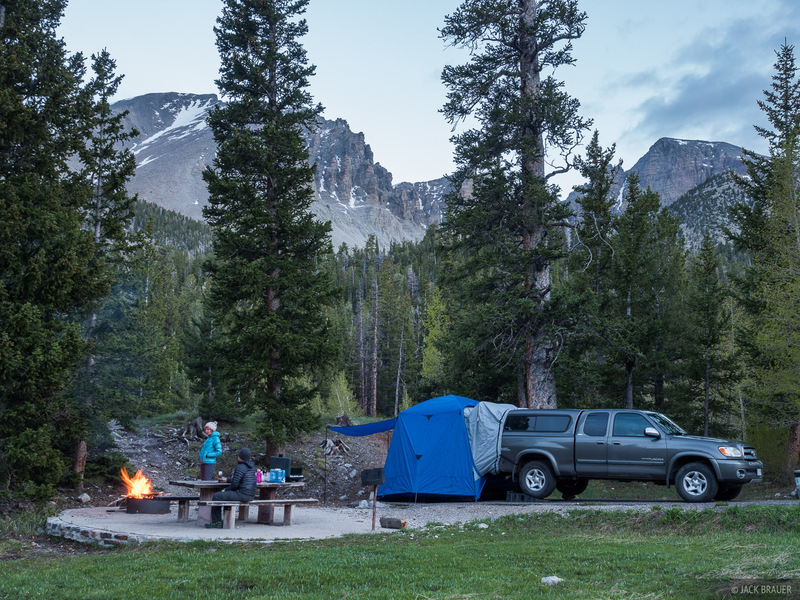 In order to keep costs down - and just for the fun of it - we camped as much as possible along the way; in fact, over the course of the three months on the road we rented hotel rooms only four times, and stayed with relatives and friends three times. 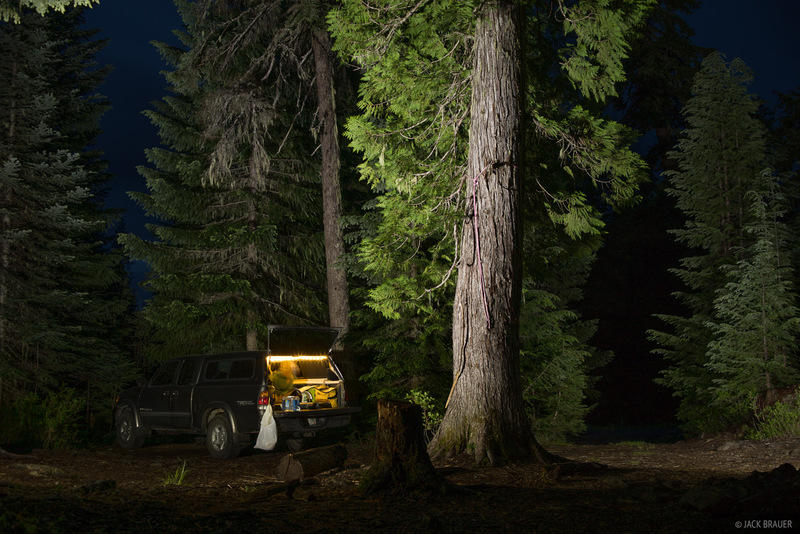 So, we ended up camping about 90 days in total, either in the back of our Toyota Tundra or in a tent while backpacking. In the following captions I've also included links to the related trip reports, so click on those to see more photos about our adventures! 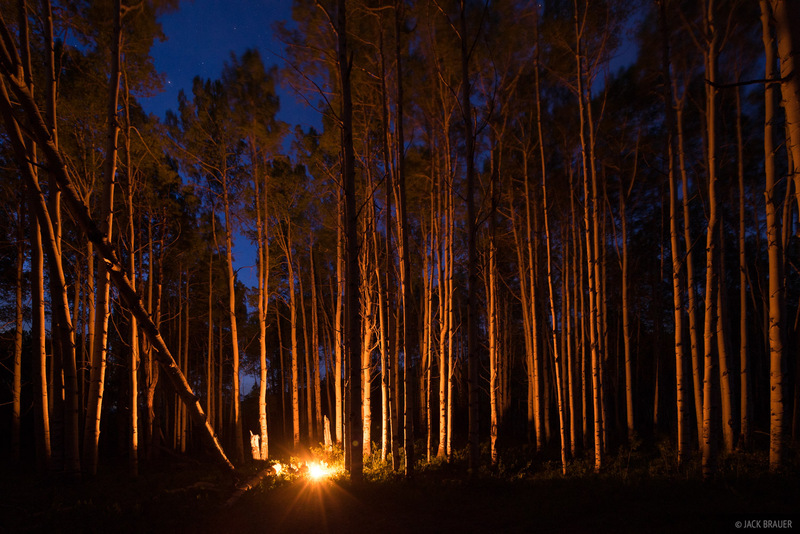 Campfire in the aspens up by Kebler Pass, near Crested Butte, Colorado. 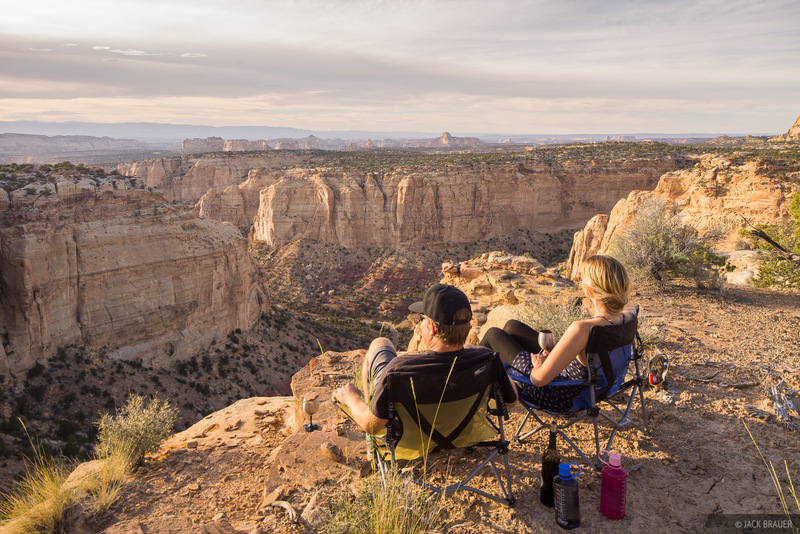 Overlooking the Ghost Rock area near I-70 and Green River, Utah. Camp below Notch Peak and the House Range in western Utah. 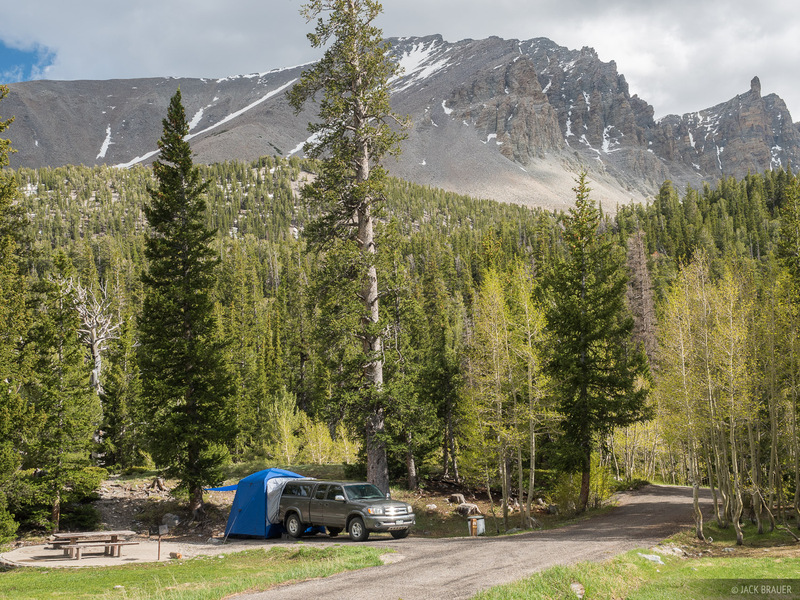 Camping at the Wheeler Peak Campground in Great Basin National Park, Nevada. 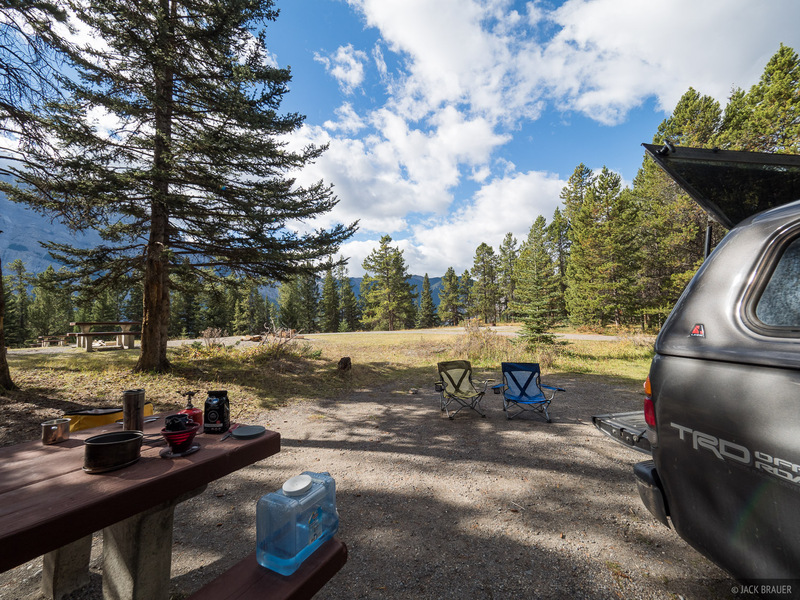 Another night at Wheeler Peak Campground. 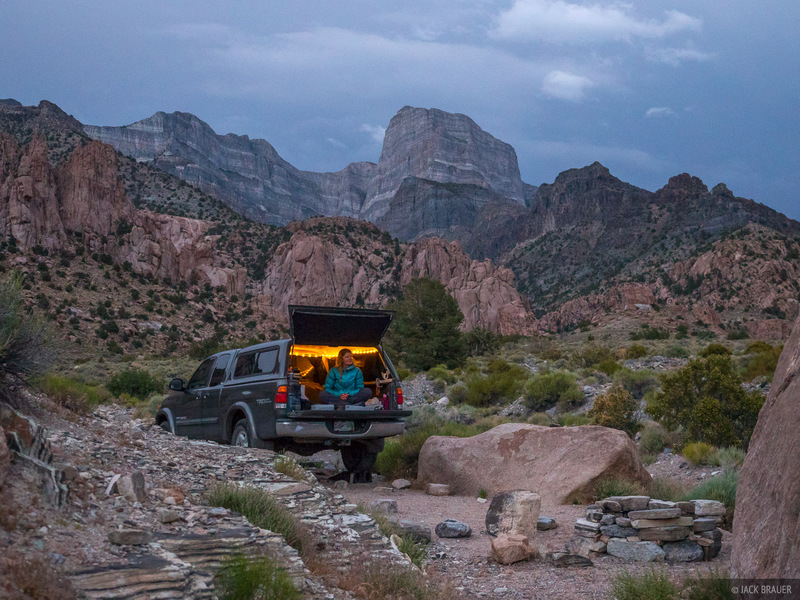 For this road trip I bought a Napier SUV tent, a car camping tent that has a unique door sleeve that allows the tent to connect to the back of a truck like ours. 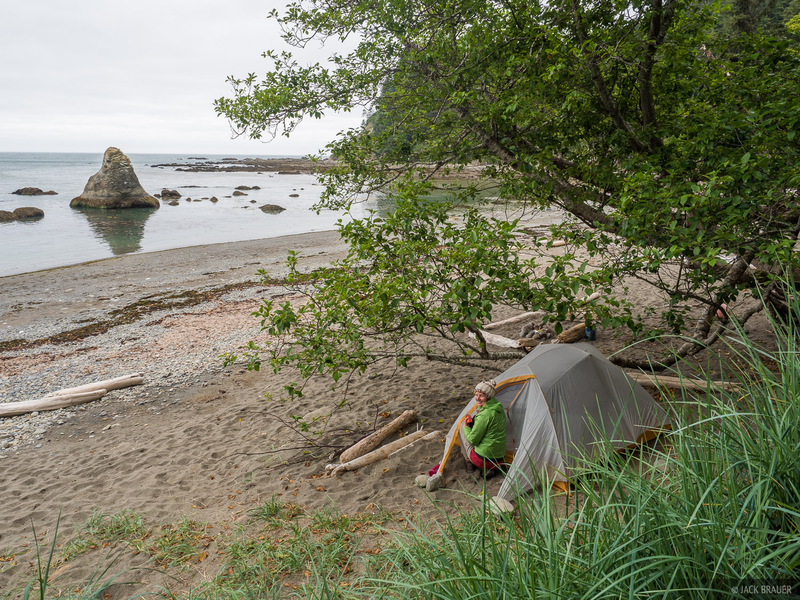 It's a nice tent and works quite well; unfortunately this would be the first and last time we used the tent on this trip. 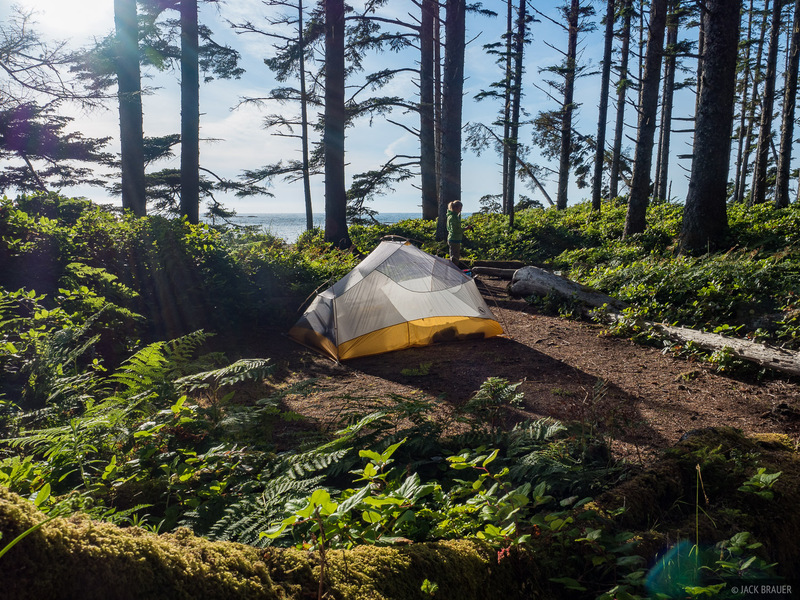 The tent is better suited for an extended camping trip in one spot; but on this trip we were constantly moving from day to day and never felt it was worth it to set it up again. 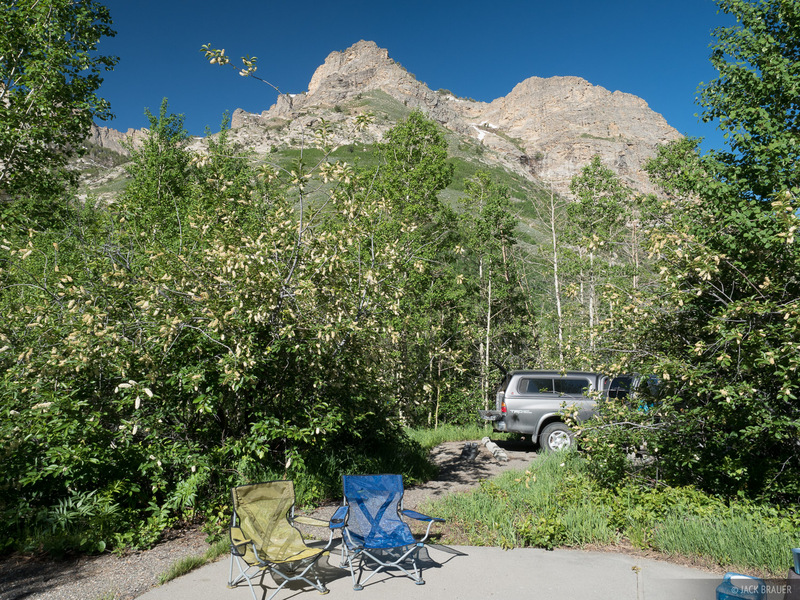 At the Thomas Canyon Campground in Lamoille Canyon, Ruby Mountains, Nevada. We stayed here for two nights. Our campsite at the D.L. Bliss State Park Campground at Lake Tahoe, California. 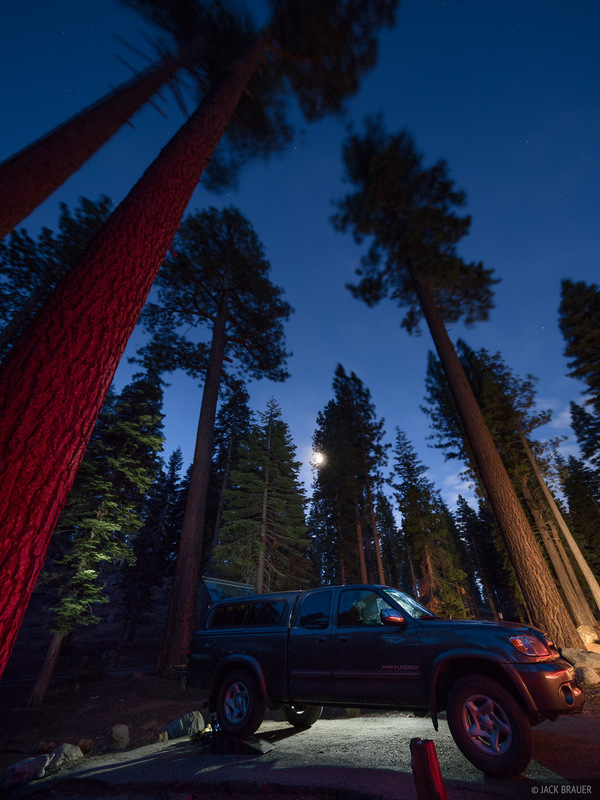 A windy night at the Bayview Campground along the south shore of Lake Tahoe, California. 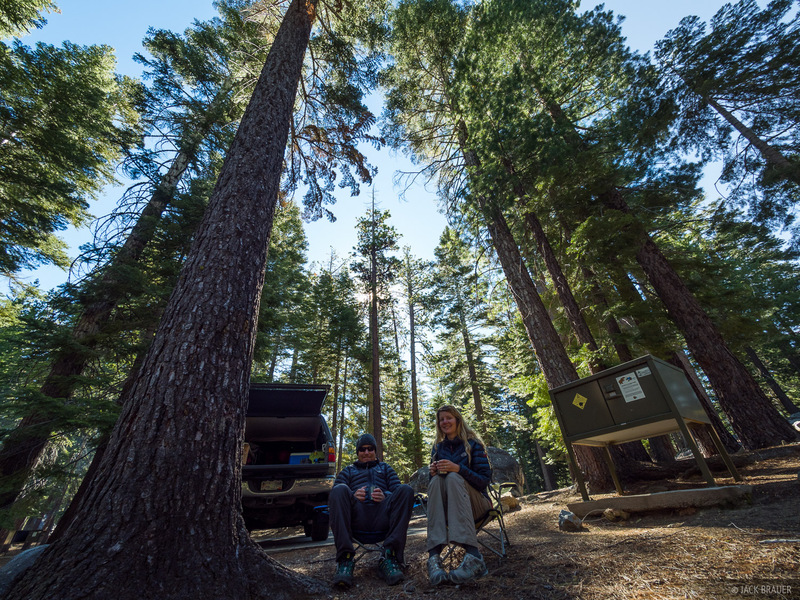 The big pines were swaying so much in the wind that we were paranoid that one of them would snap and crush our truck, with us in it! 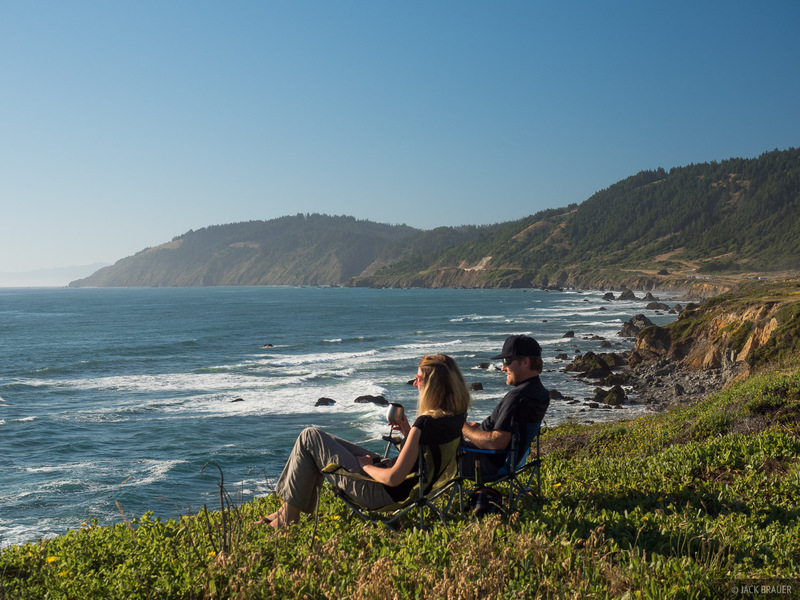 A fantastic campground overlooking the Pacific Ocean at Westport-Union Landing State Beach in northern California. 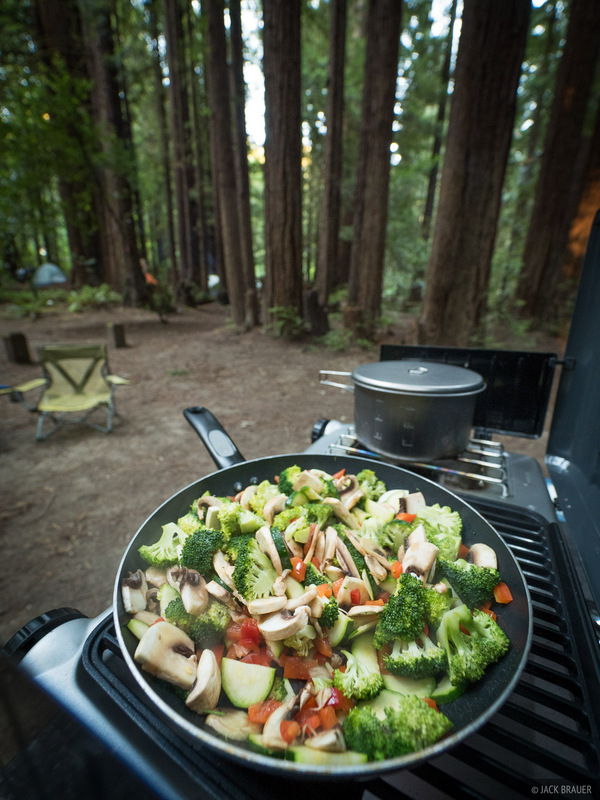 Sautéed veggies at Humboldt State Park campground, while visiting the amazing Redwoods in northern California. 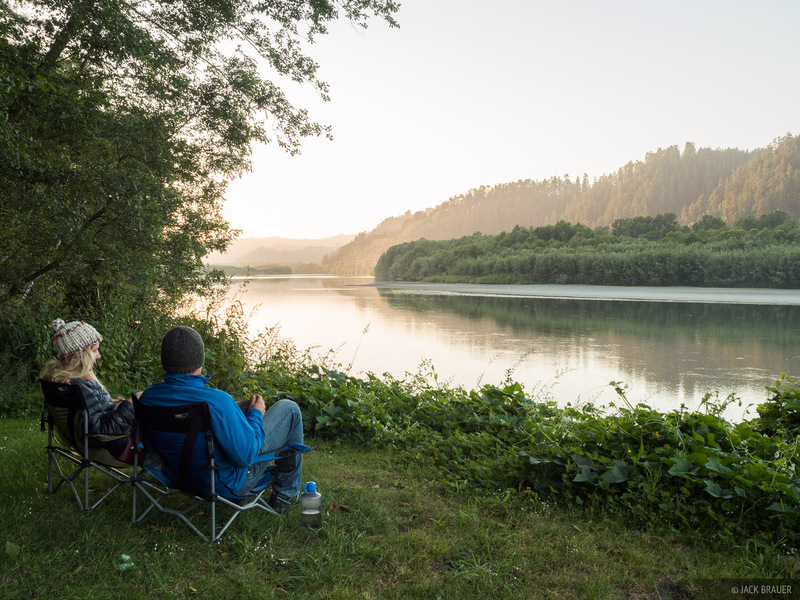 Our campsite at a tranquil RV park along the Klamath River in northern California. 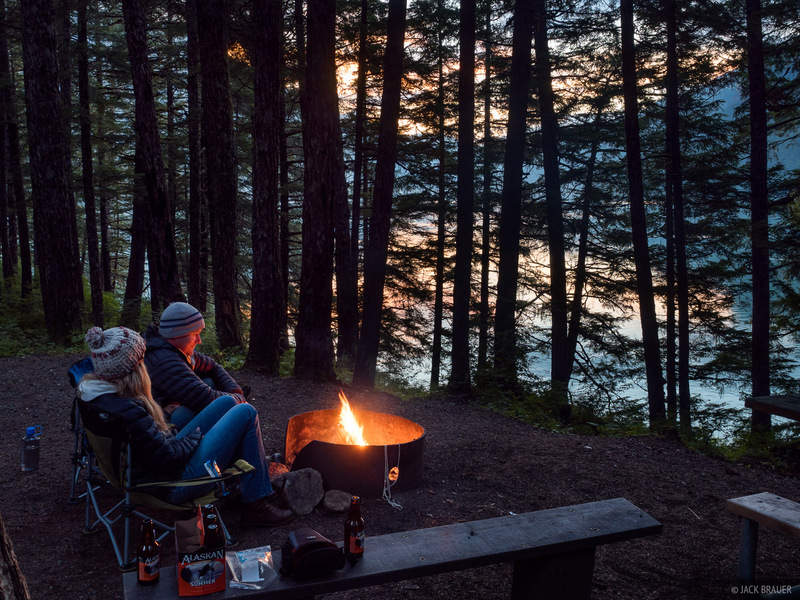 After spending three nights at my uncle's house in Ashland, Oregon, we continued on to Crater Lake National Park and spent a night at the enormous campground there. Pirate camp at random spot in the woods near Trillium Lake and Mount Hood, Oregon. After visiting my sister and an old buddy in Seattle, Washington, we drove to the Olympic Peninsula to do a trek up the coast. 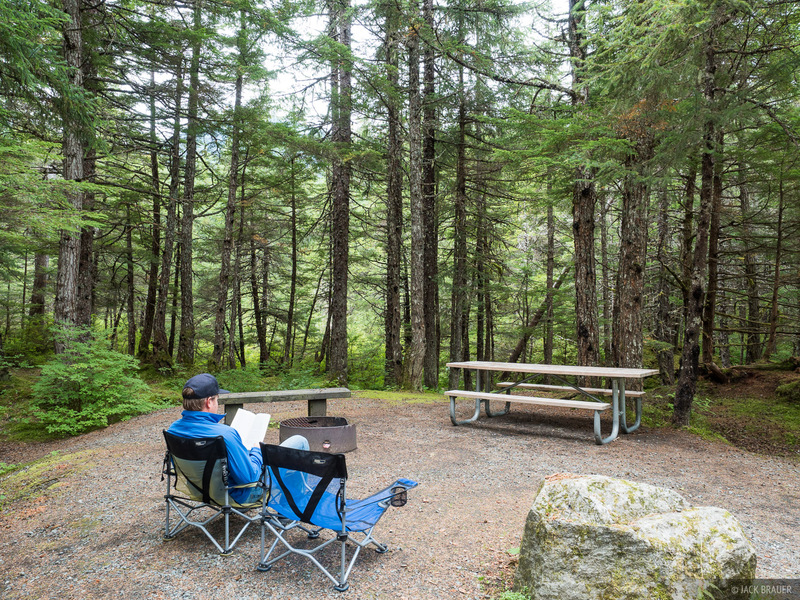 Before departing on our hike we relaxed at the quiet campground at the north shore of Ozette Lake for an evening. 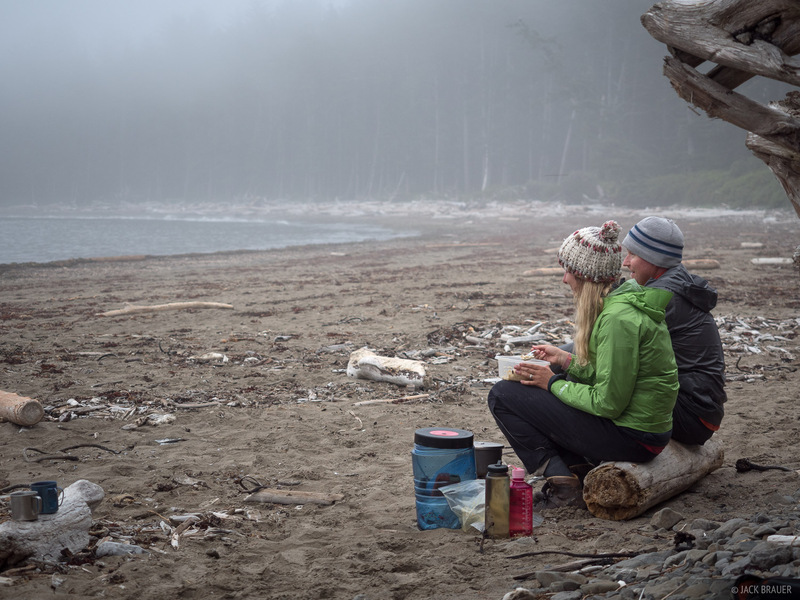 Dinner at Sand Point campsite. 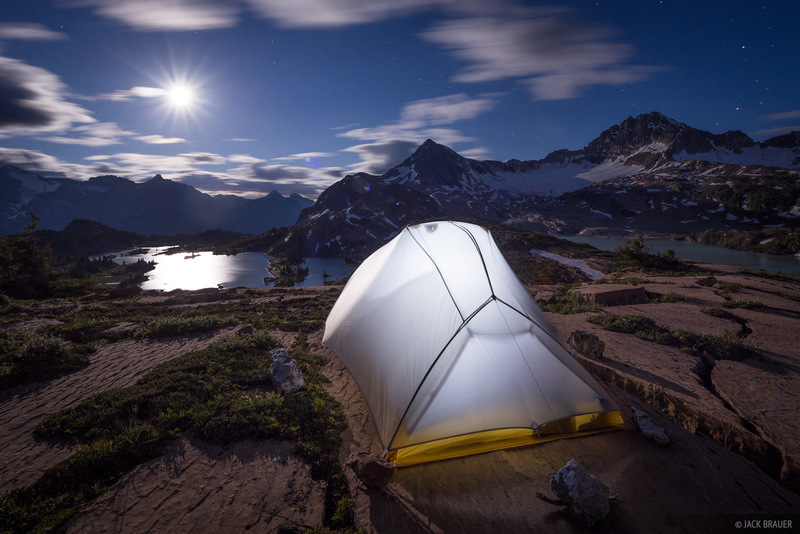 The next two nights along the Olympic High Divide Trail we camped near Heart Lake. 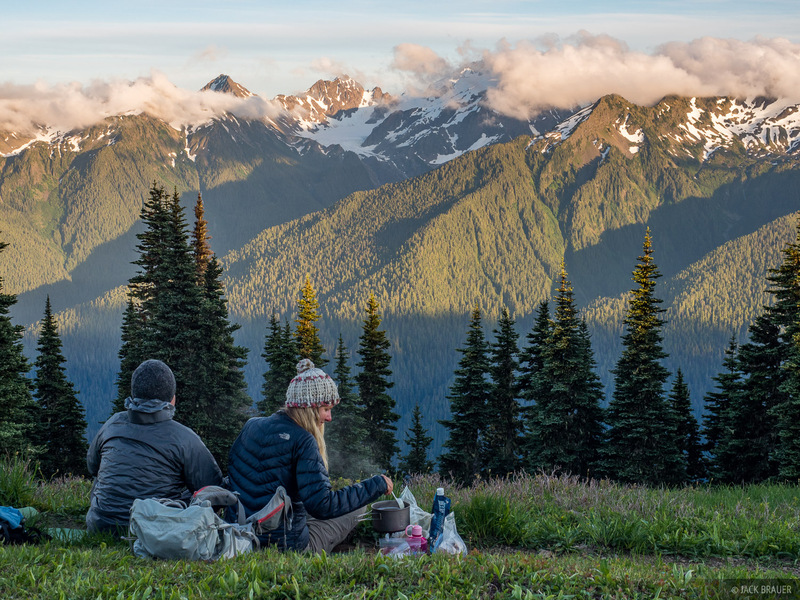 We hiked back up to the divide ridge to cook dinner and enjoy the evening views up there. 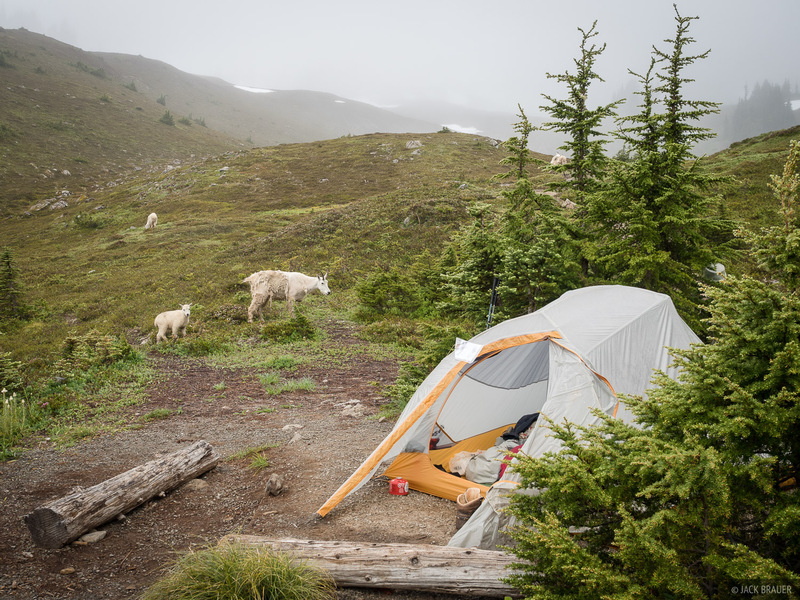 Mountain goats checking out or tent during our second (rainy) day at Heart Lake. 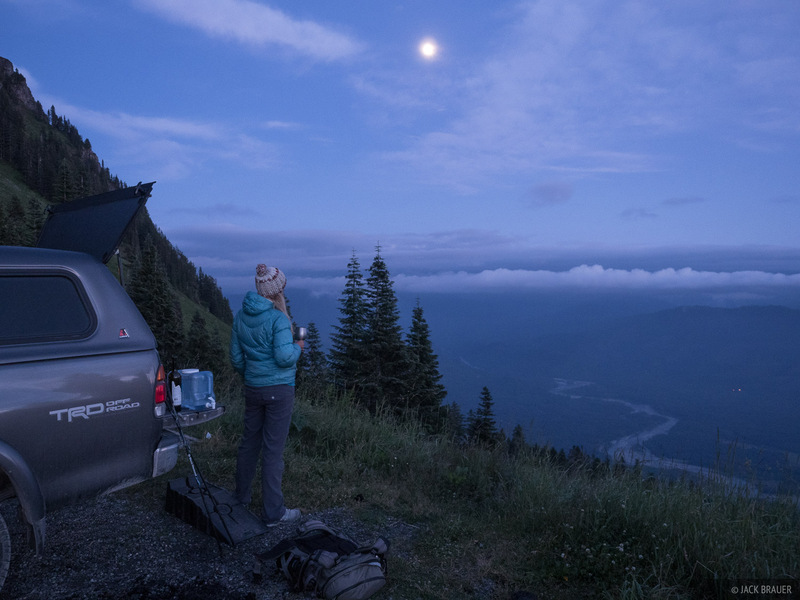 While waiting out poor weather, we car camped a few nights up on Tronsen Ridge near Leavenworth in eastern Washington. 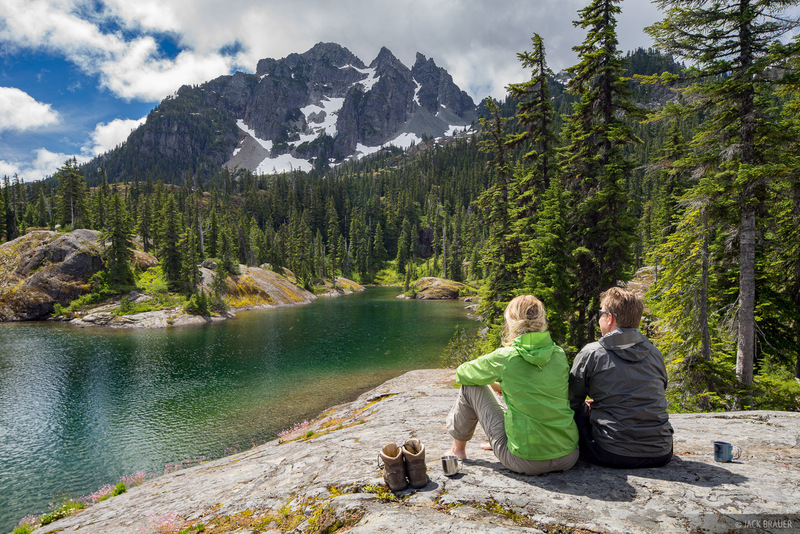 Before departing on a 5-day trek in the Alpine Lakes Wilderness in Washington, we drove up a long switchbacking forest road above Salmon La Sac and camped with a wonderful panoramic view of the valleys we'd soon be hiking through. 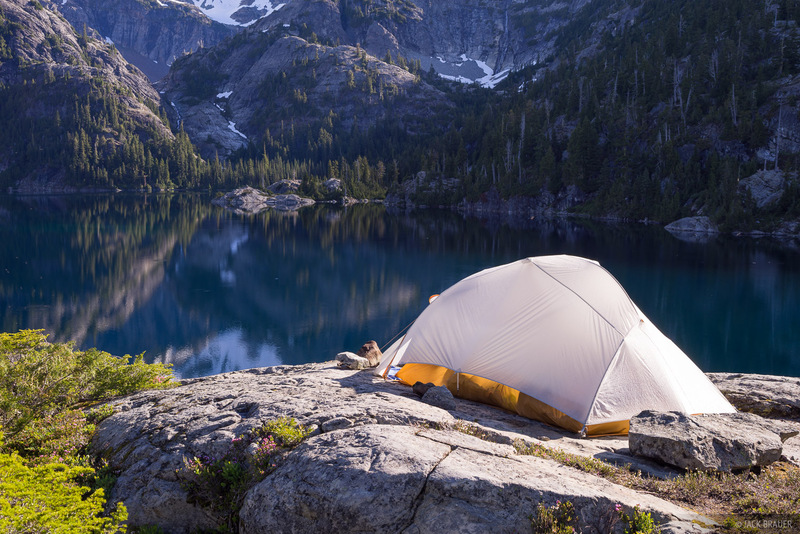 Our first evening of our 5-day trek in the Alpine Lakes Wilderness of central Washington, camped at Spectacle Lake. 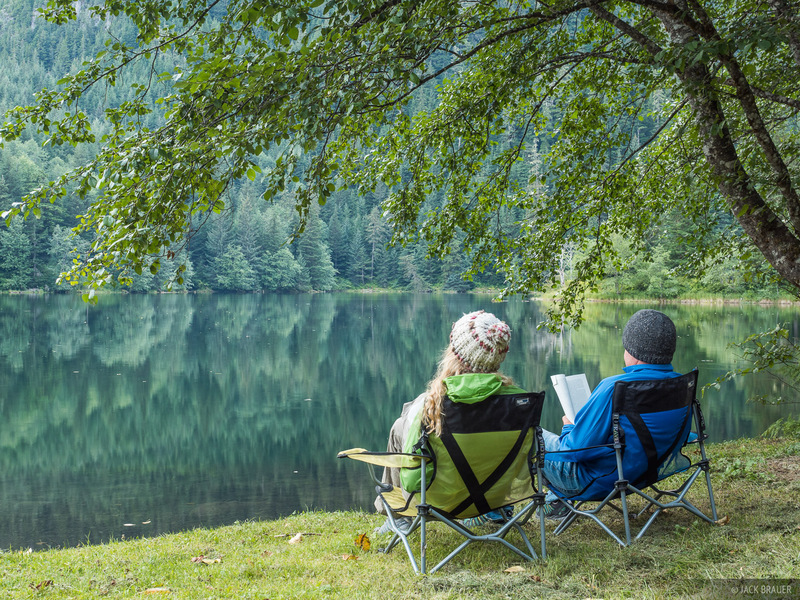 A rest day at Spectacle Lake -- with some sun too! 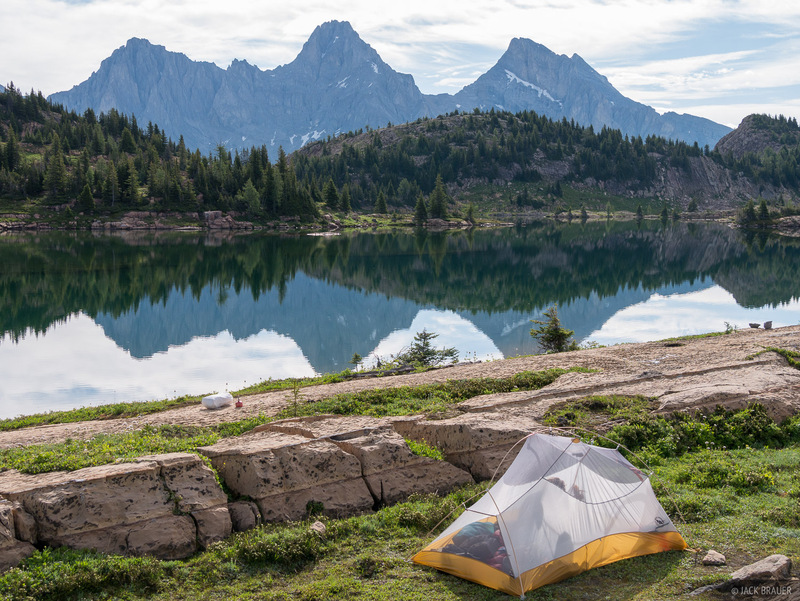 Quite the view from our tent at Spade Lake, with Mount Daniel rising behind. 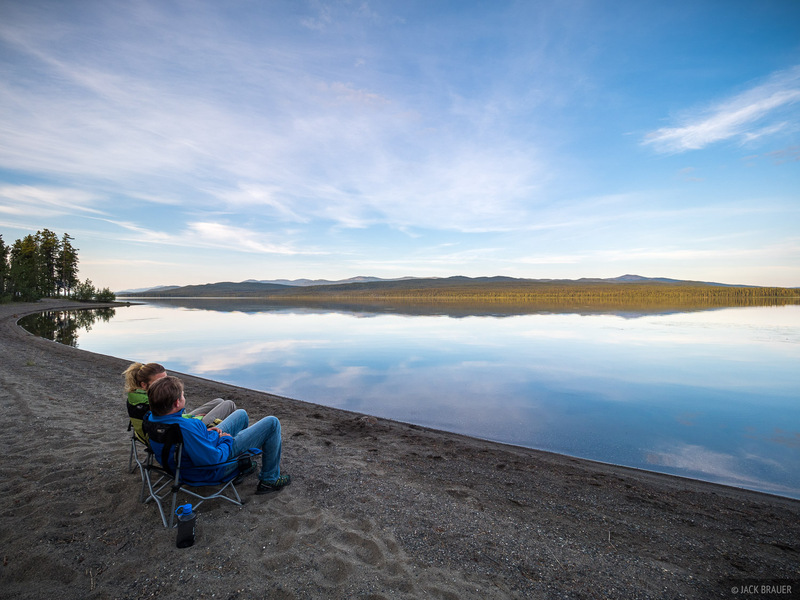 A rest day at Spade Lake before the long hike out the Waptus River valley. 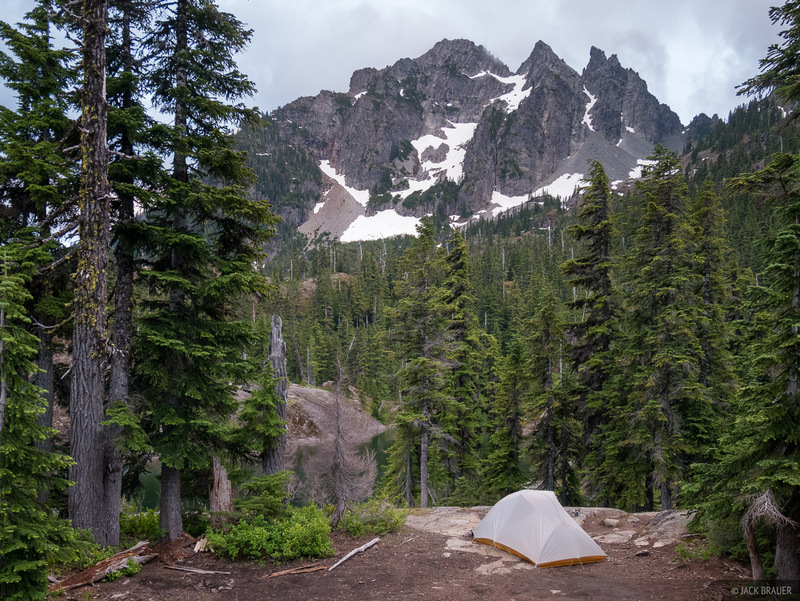 After our trek in the Alpine Lakes Wilderness, we drove north to Mount Shuksan where we found a random campspot that would have had a great view of the peak, if not for the clouds shrouding it. 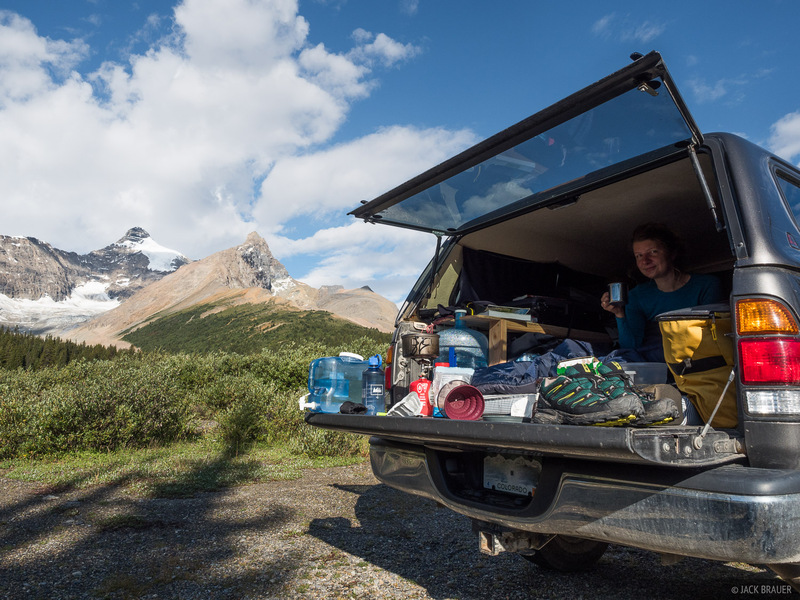 Notice how we removed the back seat from the truck and put some plastic drawers in there instead - a huge convenience for a long road trip! 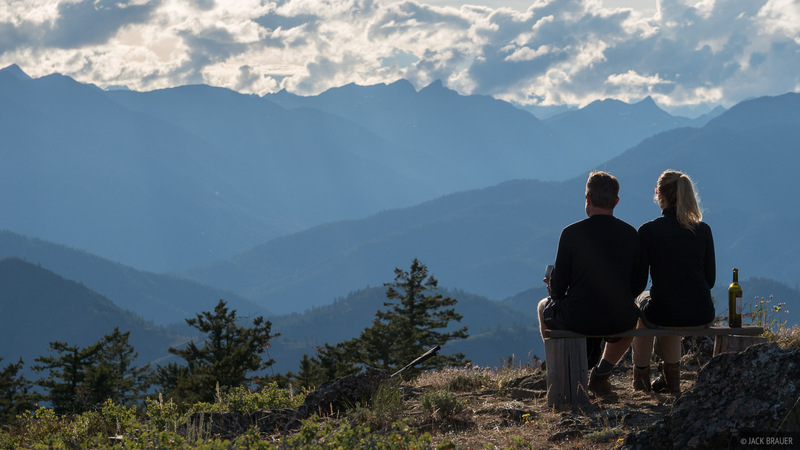 Before heading over the North Cascades Highway we spent an evening at the Sauk Mountain trailhead. After Washington we drove towards the Canadian Rockies and rented our second motel room of the trip in the small mountain town of Fernie. 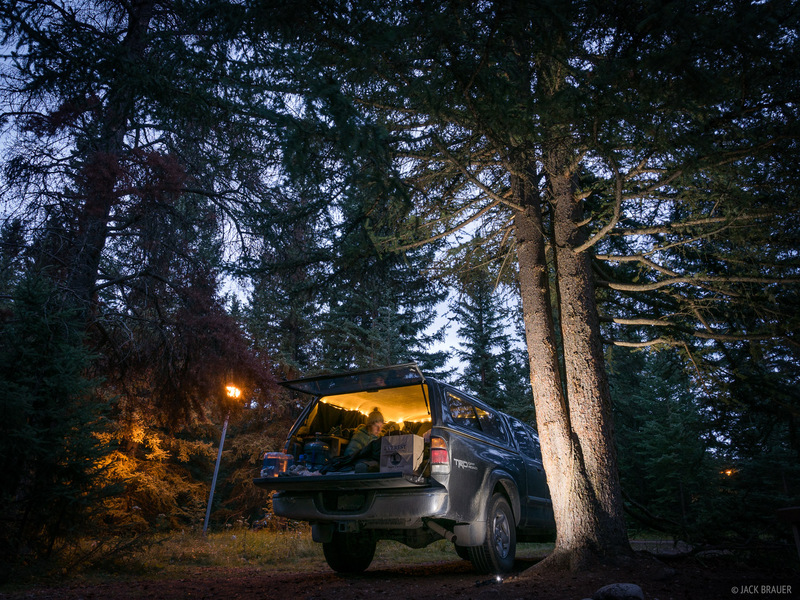 From there we drove out for our first backpack trek in Canada and camped at the trailhead before a long day of hiking the next day. 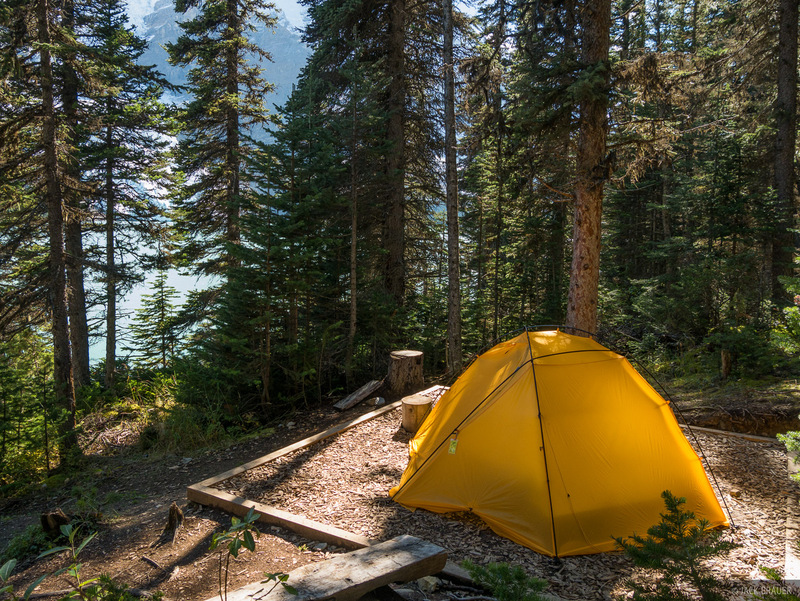 For our second night in the Height of the Rockies Provincial Park, we moved our tent down to the lake where we camped on an isthmus out in the middle of the lake. Exhausted after our 4-day trek in the Height of the Rockies Provincial Park, we drove towards Banff. 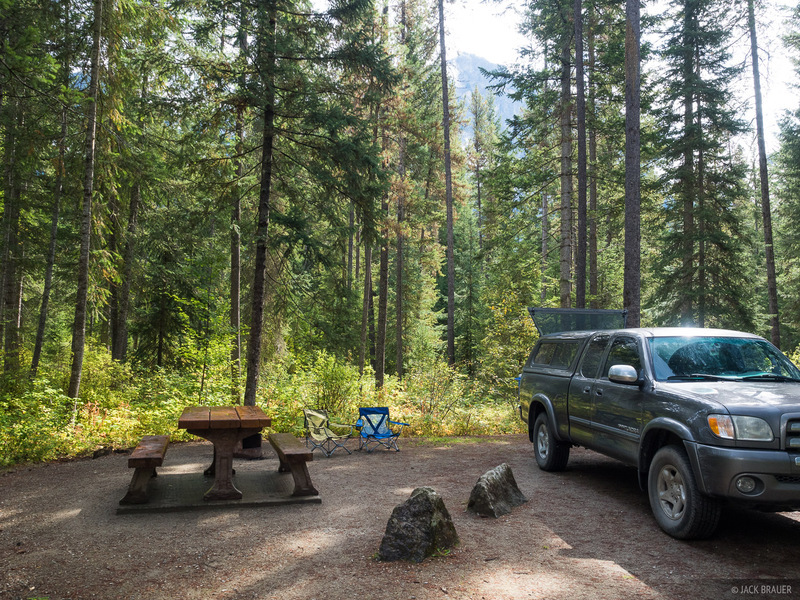 After a couple hours of driving it dawned on us that we were actually inside Kootenay National Park, which explained why we were having so much trouble finding any random forest roads to camp along. With the official campsites packed full, we had no option but to pirate camp in a random parking lot. Not the finest campsite ever but it got the job done! 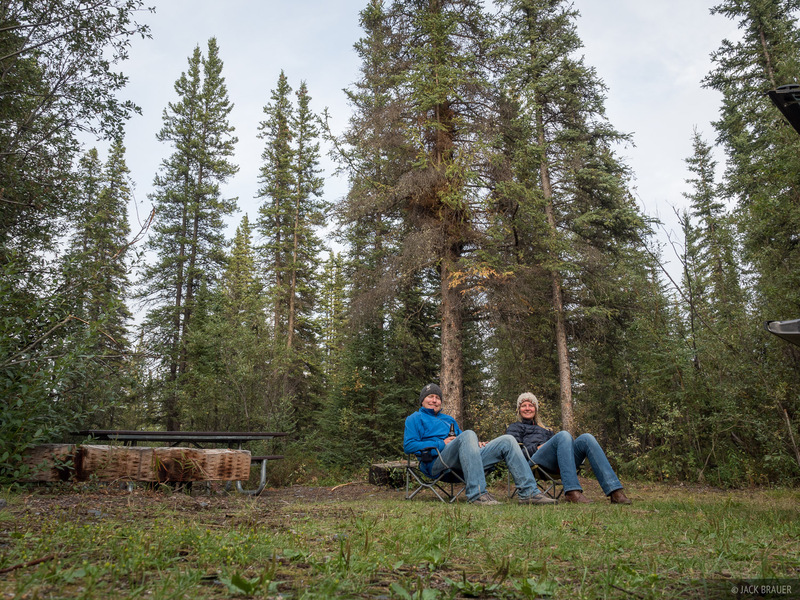 In Banff we stayed in the massive Tunnel Creek Campground, where we enjoyed showers finally, and a fine dinner in town. 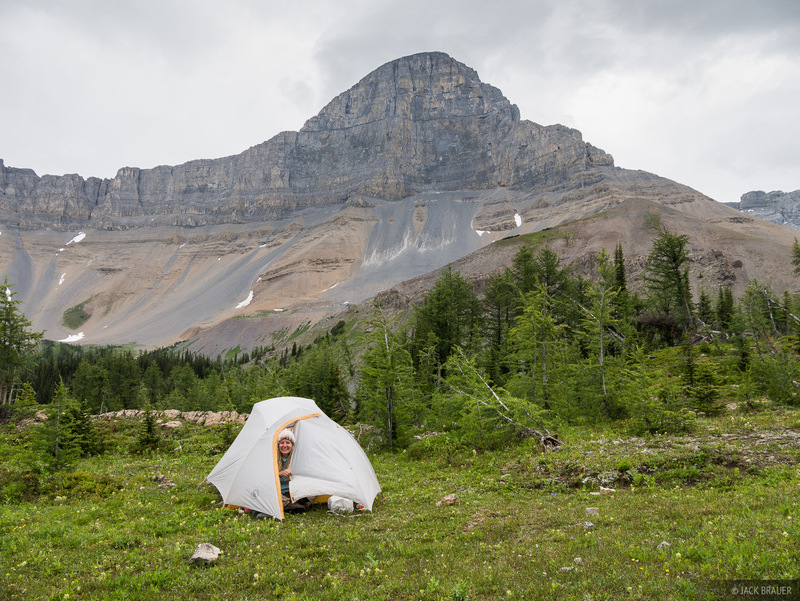 From Banff we were fortunate to book online literally the last available campsite at Lake Louise Campground, where we stayed for three nights while doing dayhikes near Lake Louise, including the big boy Mount Temple. 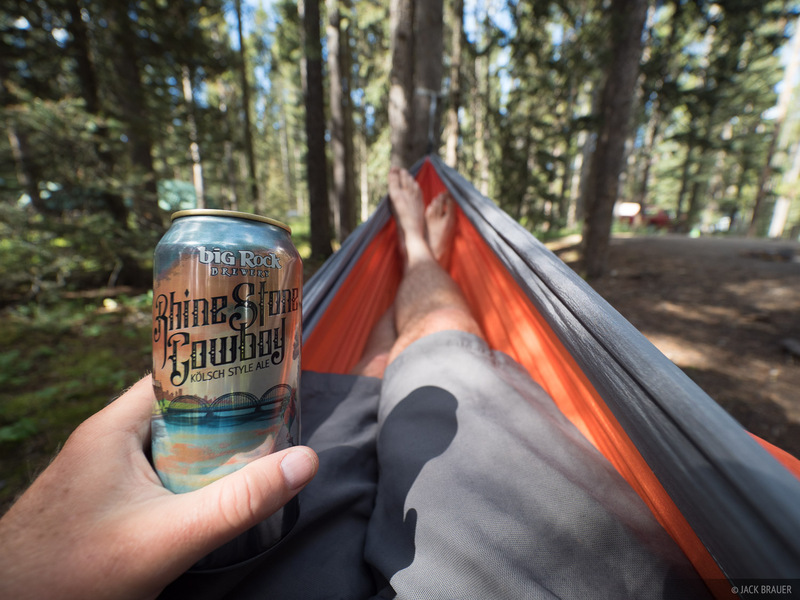 And here I am back down at the Lake Louise campground after hiking Mount Temple, with tired legs and a delicious cold beer! Have I mentioned how tasty the craft beer in Canada is? 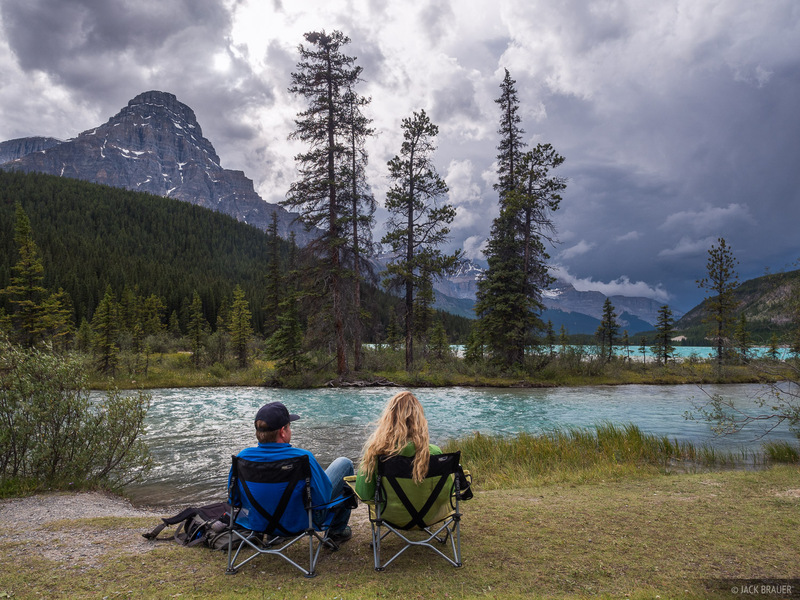 Sitting out the rain in the back of the truck at the Lake Louise campground. In this picture you can kind of see our setup back there, with a foam mattress and a homemade shelf on the right side to help organize things and free up space. With black-out curtains and a string of yellow Christmas lights, it's quite cozy in there! 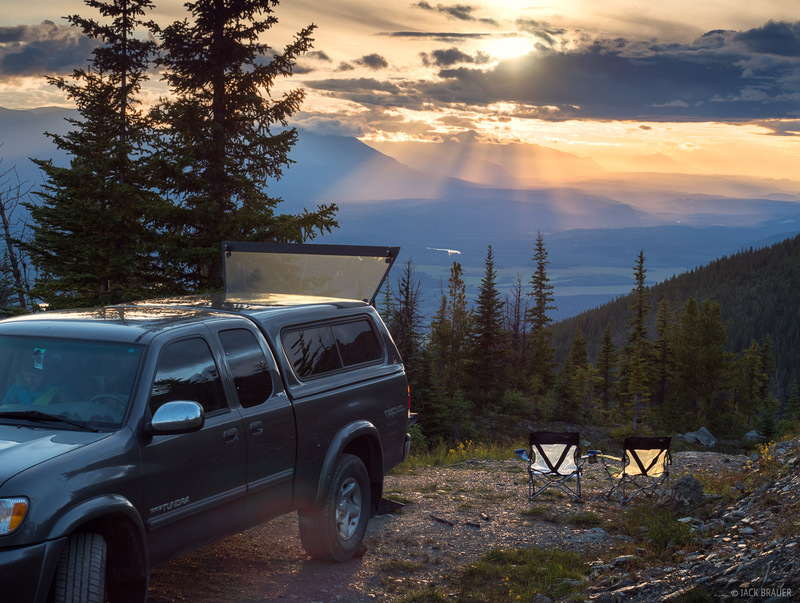 Camping in the truck up at Sunwapta Pass, right on the border between Banff and Jasper National Parks. Mount Athabasca is behind. 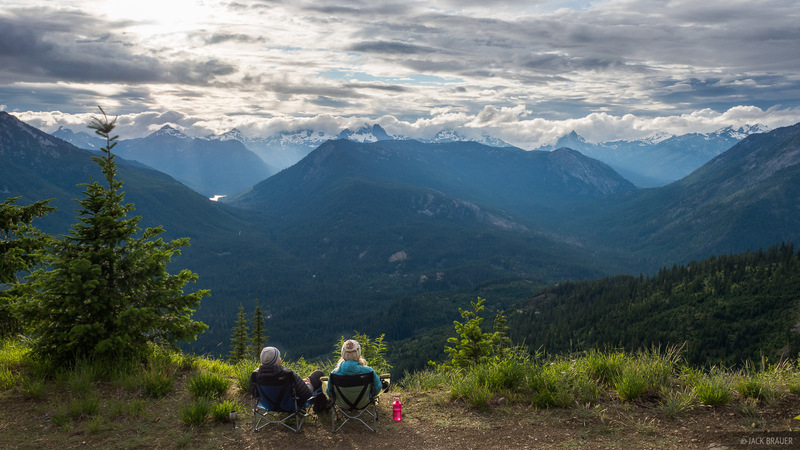 Between long days of driving, we stopped for a night at the municipal RV park in Smithers, BC. 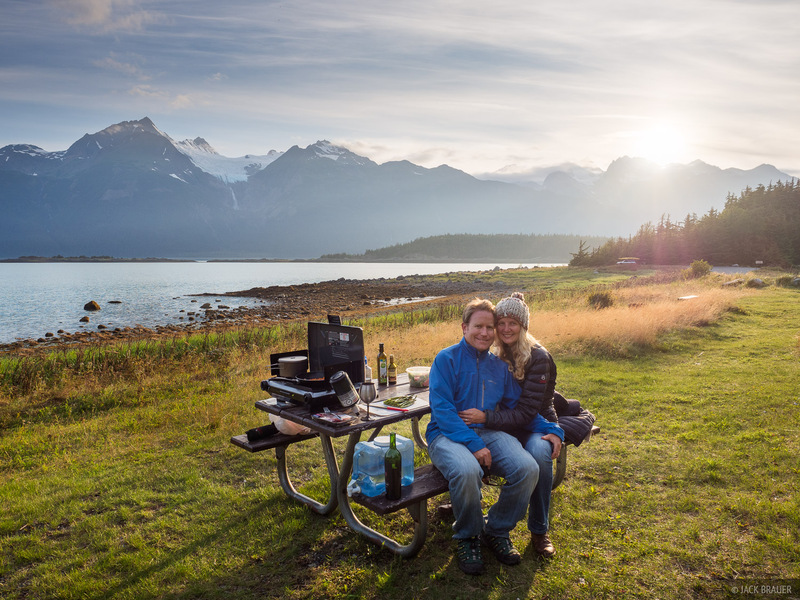 Celebrating our 4th anniversary with a gourmet dinner and some vino at Chilkat State Park in Haines, Alaska. 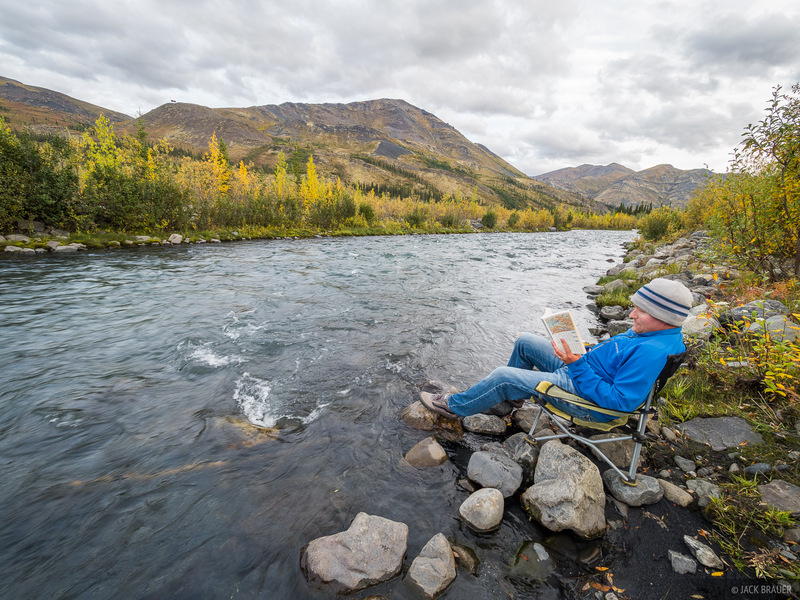 We spent about four days in Haines, relaxing, hiking, and generally just waiting for a hopefully better weather forecast elsewhere in Alaska. 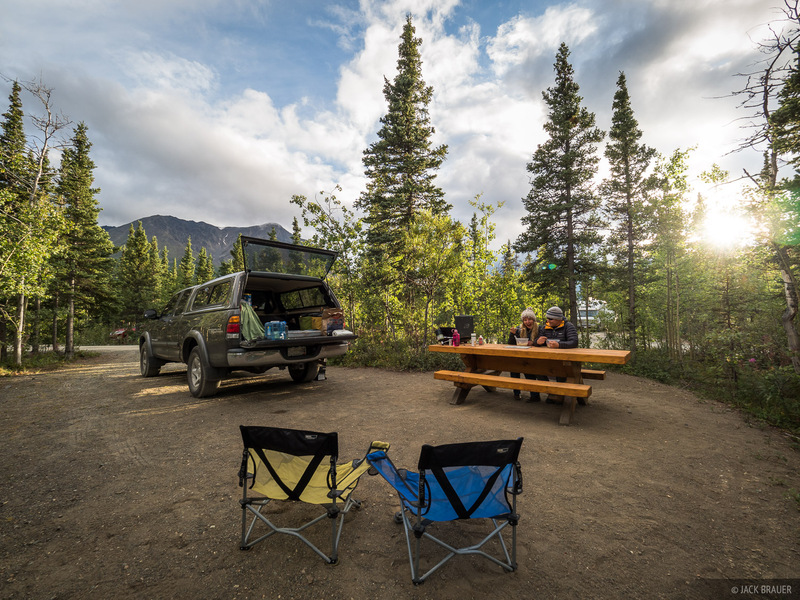 Campsite at the Chilkoot Lake campground near Haines, Alaska. From Haines we drove back towards Haines Junction and camped for a night at the Kathleen Lake campground before hiking up King's Throne mountain (seen in the background). 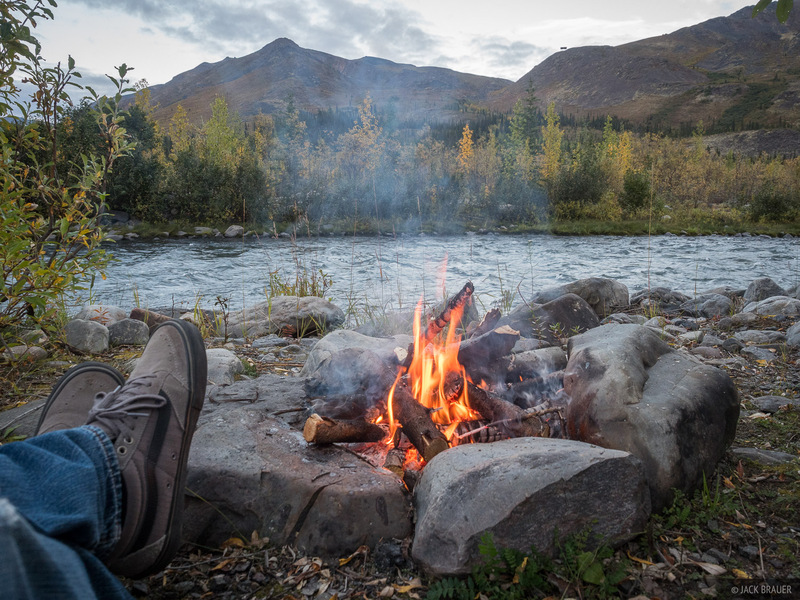 We found a nice random camp spot by a river to spend the night before heading out on a 4-day backpacking trek along Slim's River in Kluane National Park in the Yukon, Canada. 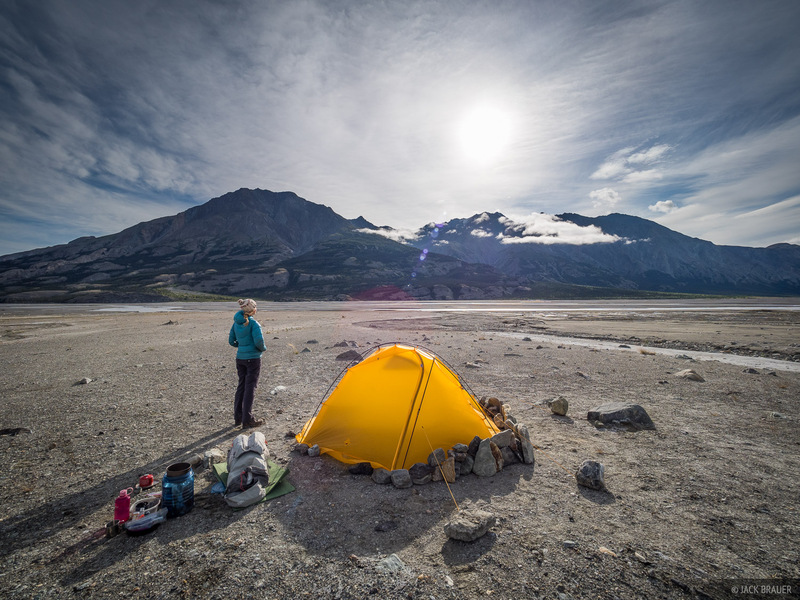 Our third evening in Kluane National Park, at the Canada Creek campsite. 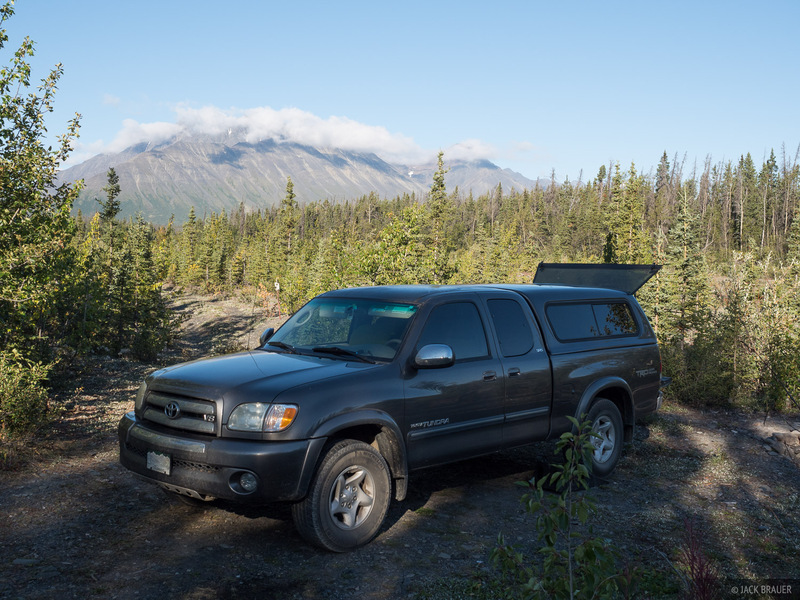 After our Kluane trek we continued driving north towards Alaska. 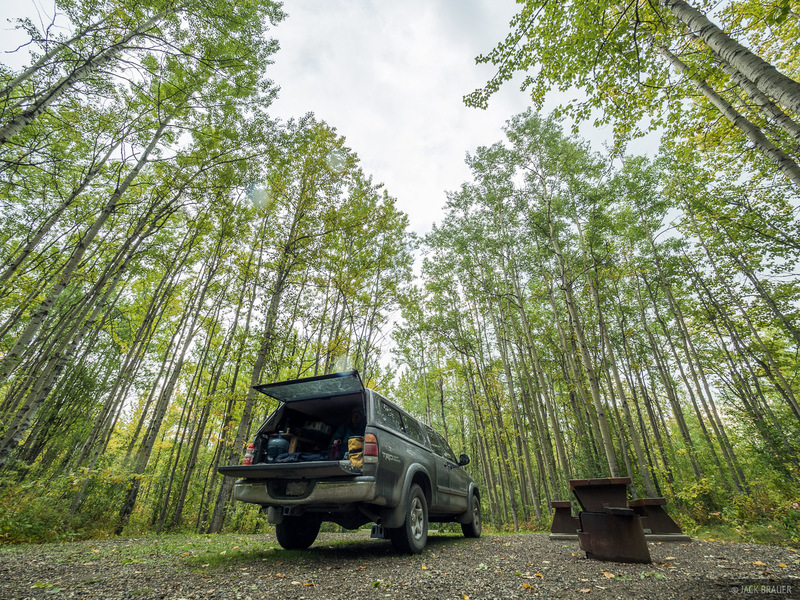 We spent a night at this RV park before crossing the border. 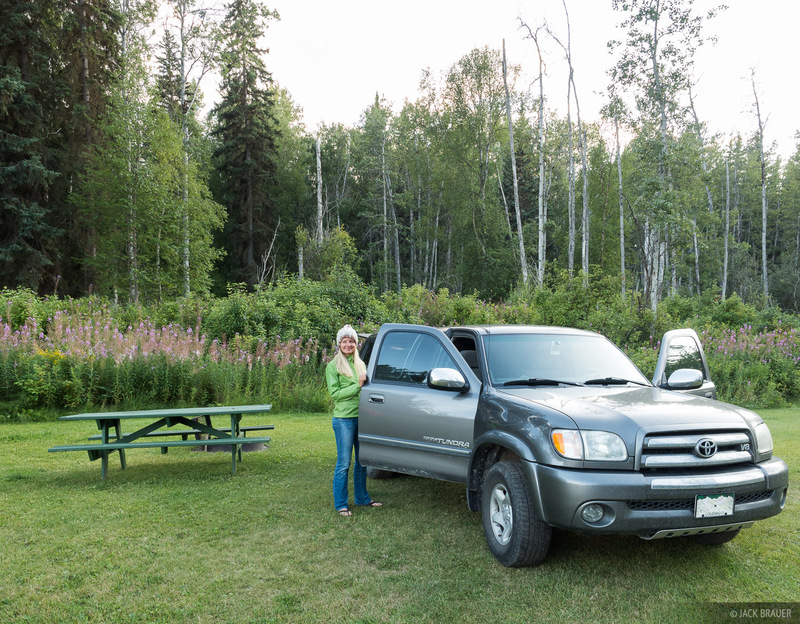 Still smiling at a bug-ridden campground near Glennallen in Alaska. Claudia retreated into the truck shortly after this photo; I followed not too long after! 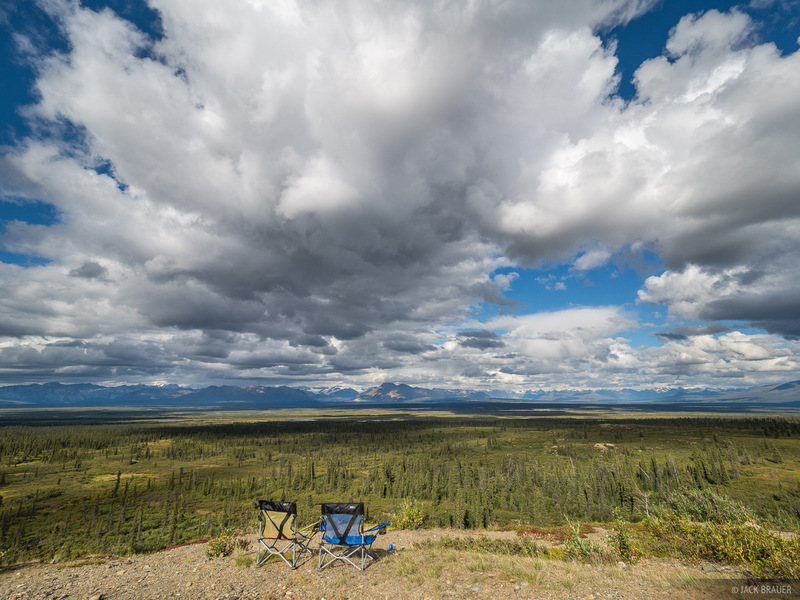 Driving along the remote and potholed Denali Highway, we spent an evening at this random camp spot overlooking the vast Monahan Flats. 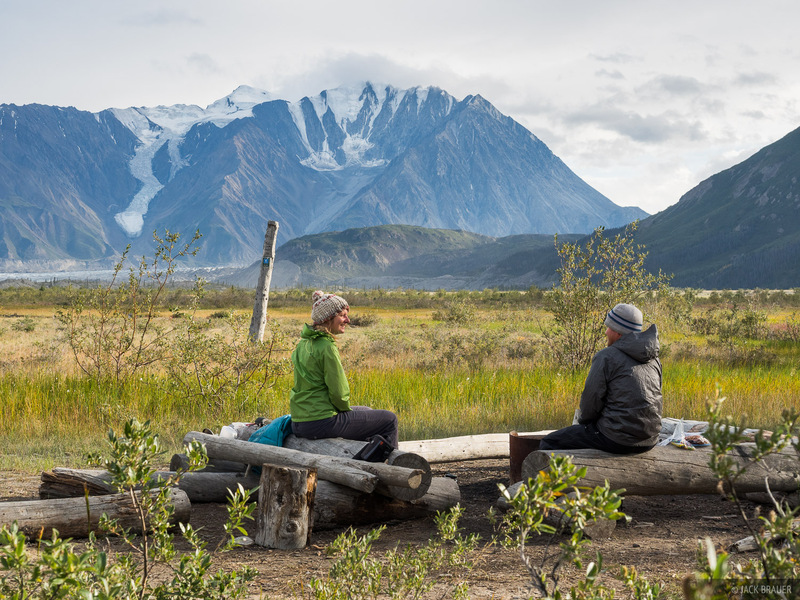 To me this was a classic Alaskan setting -- or at least how I had imagined it to be -- with tundra extending as far as the eye can see and rugged glaciated mountains beyond. This spot here was the nearest road to any of the mountains you can see in the distance. 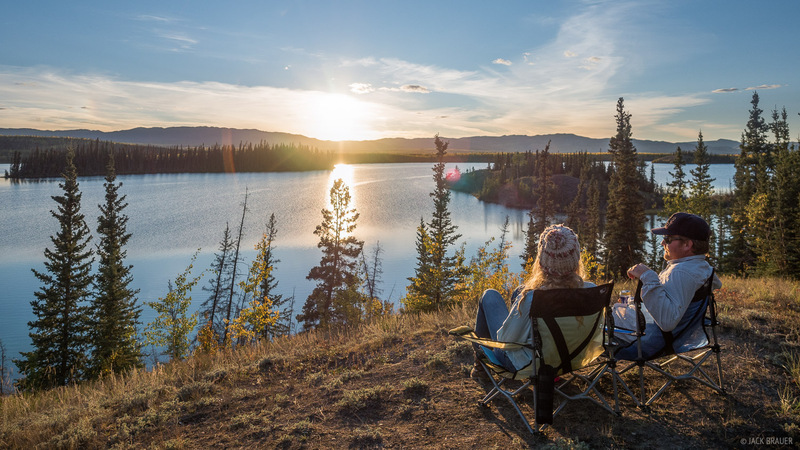 True wilderness. 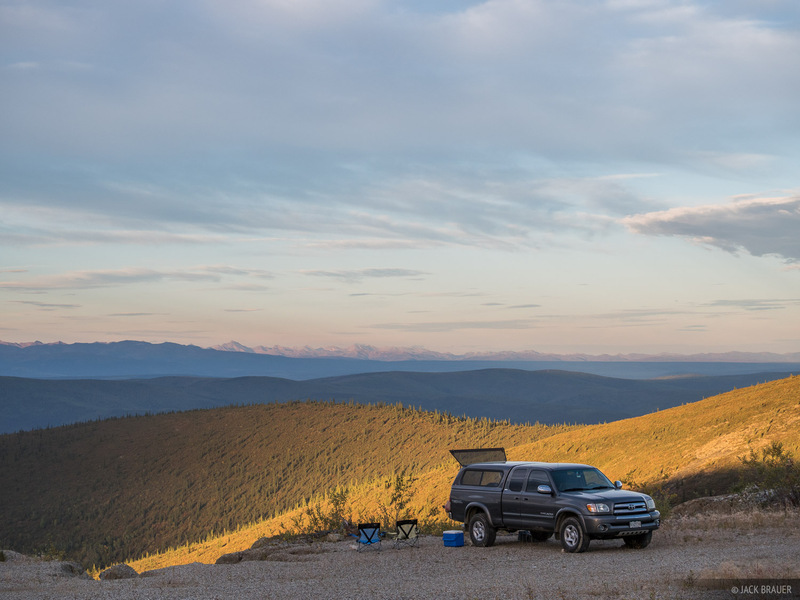 Heading towards Dawson, after we crossed the border into Canada we camped at a random spot along the Top of the World Highway, with distant views towards the Tombstone Range. 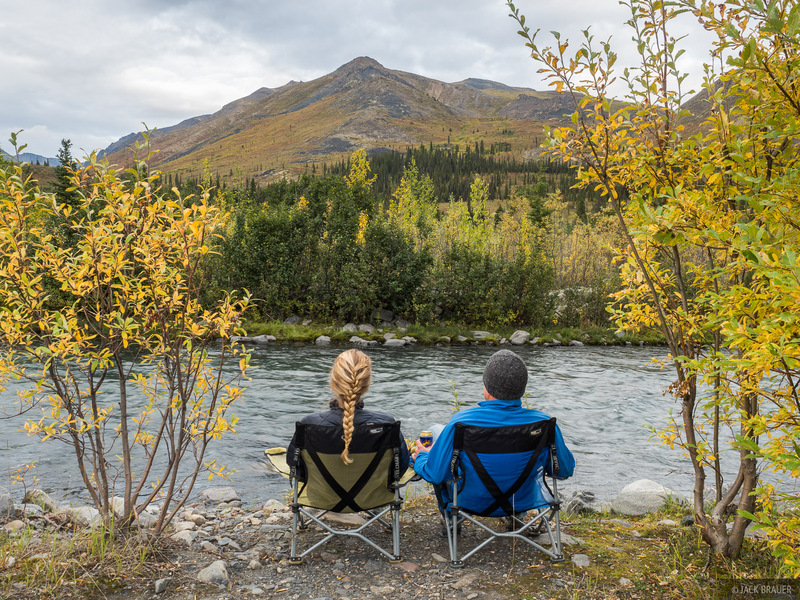 Before backpacking in Tombsone Range, we needed to wait out rainy weather, so we camped along the North Klondike River for about a week. 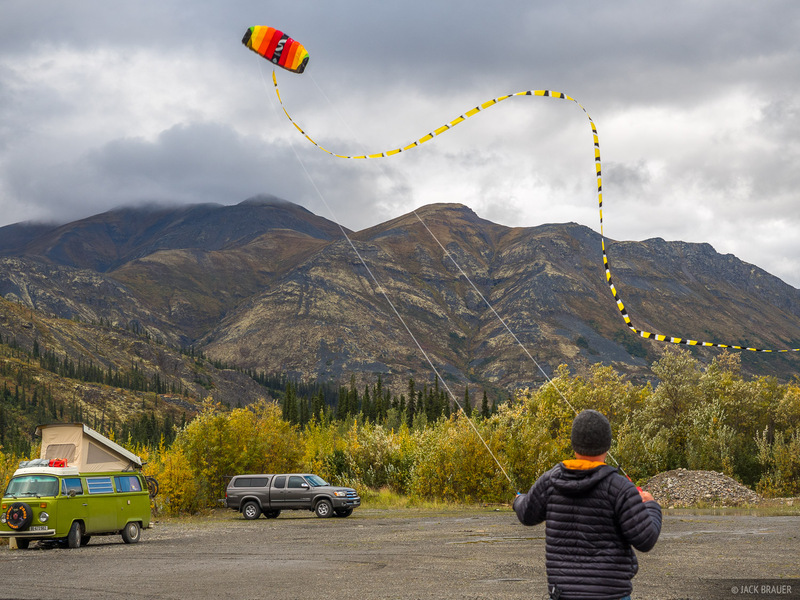 Flying the kite near the North Klondike River, just killing some time before our 7-day backpack trek in the Tombstone Range, Yukon. 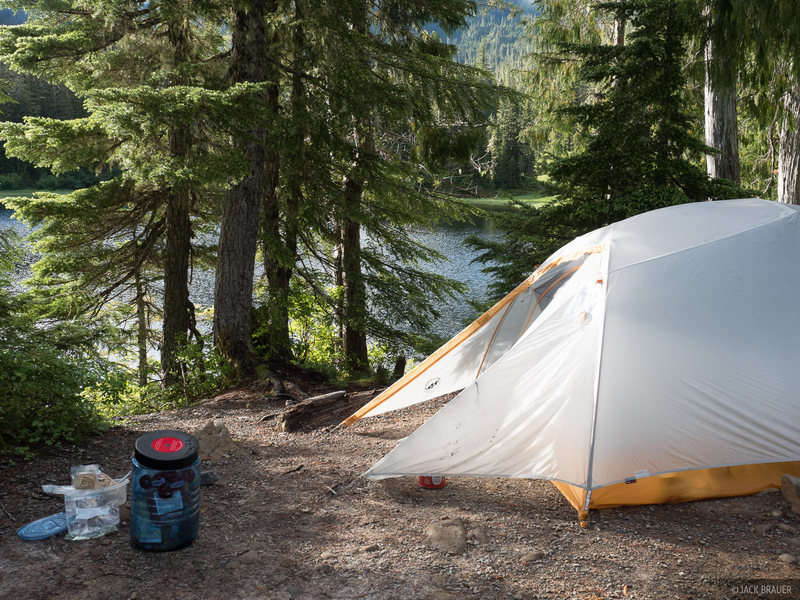 Our tent at Grizzly Lake. 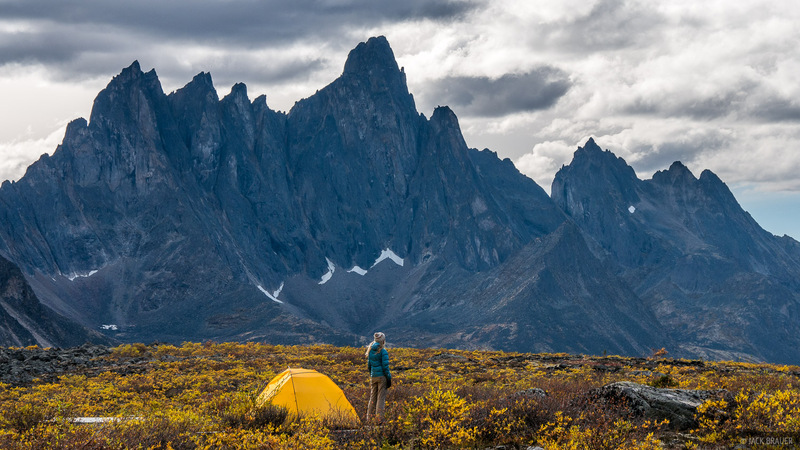 In order to preserve the landscape in Tombstone Territorial Park and also to help prevent grizzly bear encounters, all backpackers are required to camp at several designated campsites along the range. 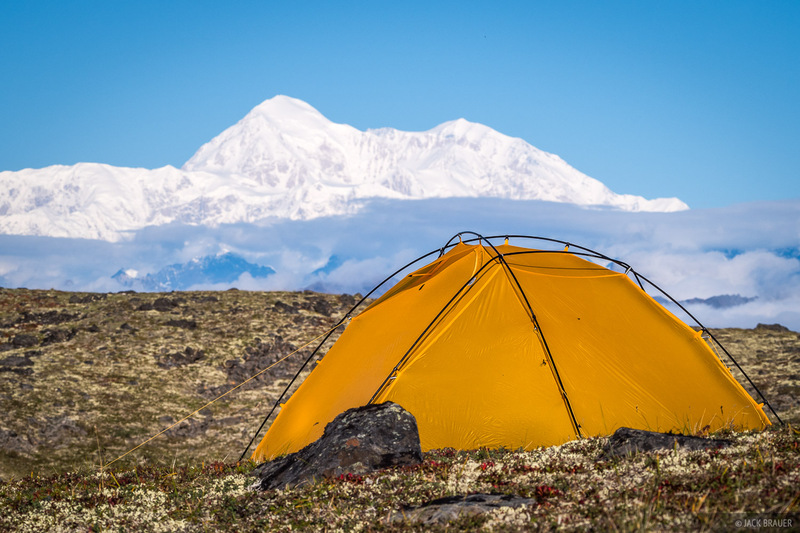 Each tent site has an elevated tent pad, and there are ropes strung along the paths to keep people from trampling the fragile and squishy tundra. 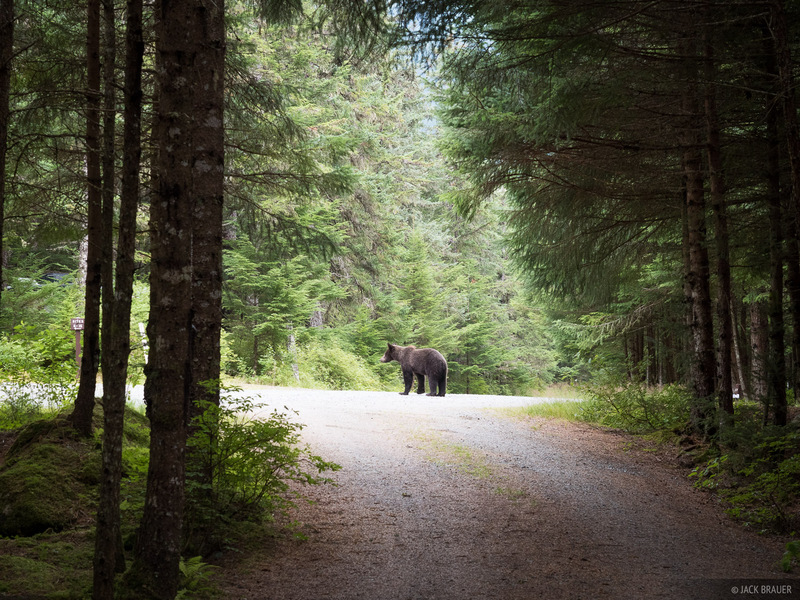 There are also outhouses, cooking tents, and storage lockers to keep food away from the bears. I think much of this didn't exist until recent years, but it's probably a good thing as the range inevitably becomes more well known. 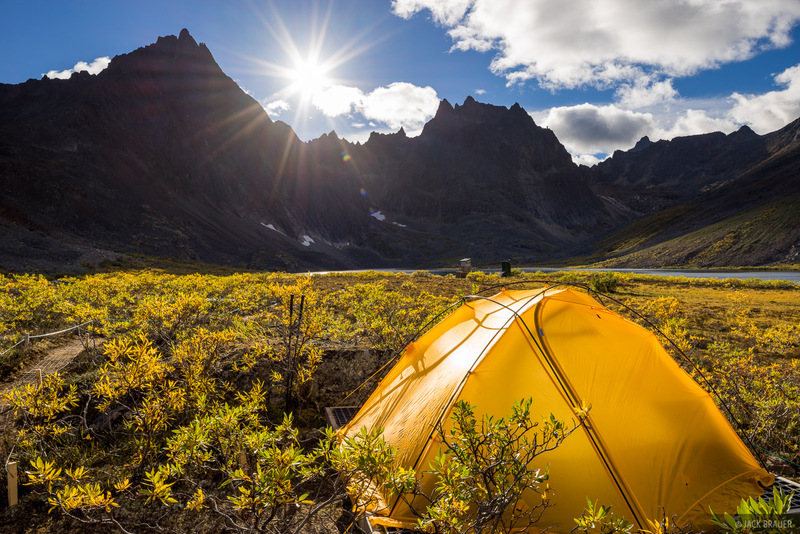 Our yellow tent camouflaged in yellow autumn tundra willows at Divide Lake. 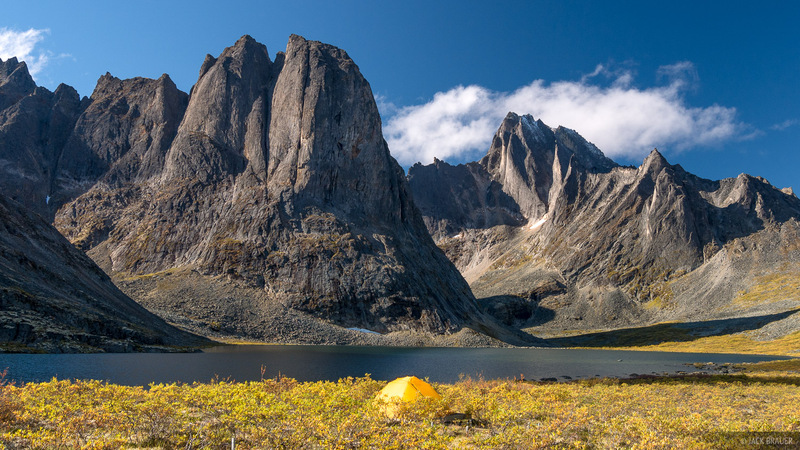 The peaks around Divide Lake were super impressive to me, reminiscent of the Wind River Range in Wyoming but in a totally different Yukon tundra environment. 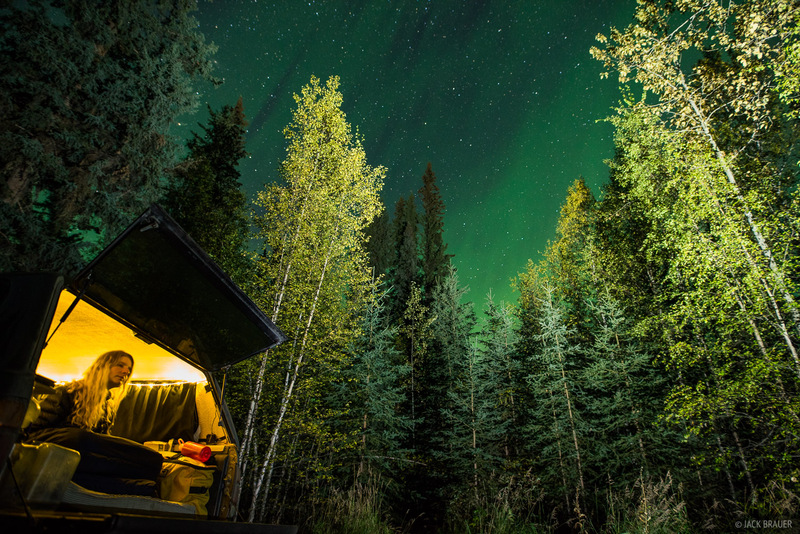 Auroras dance in the sky above our tent at Divide Lake. 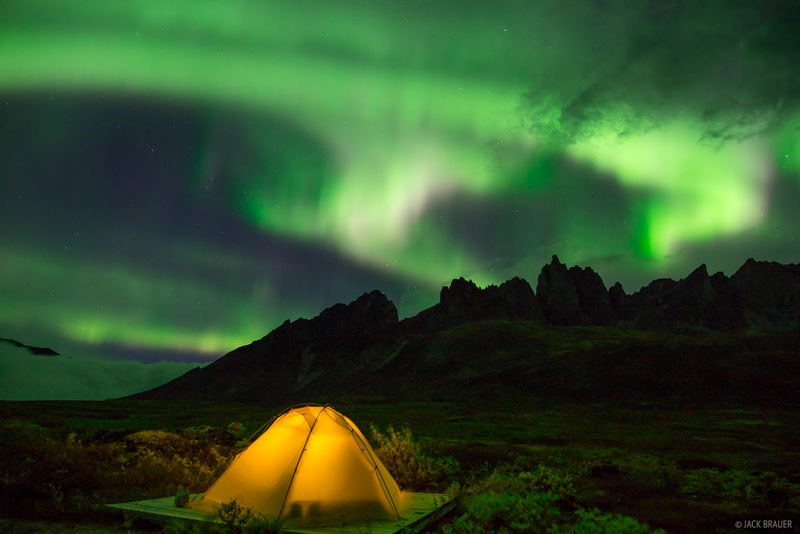 Every evening when fellow campers were hanging out at the cook tent, we'd all agree to shout and wake each other up in the night if and when we saw aurora activity. I was setting my alarm for every hour in the night to check, but the auroras sometimes come and go so quickly that you could still miss them. So a few times I awoke to shouts of "AURORA!" and quickly scrambled out of the tent! 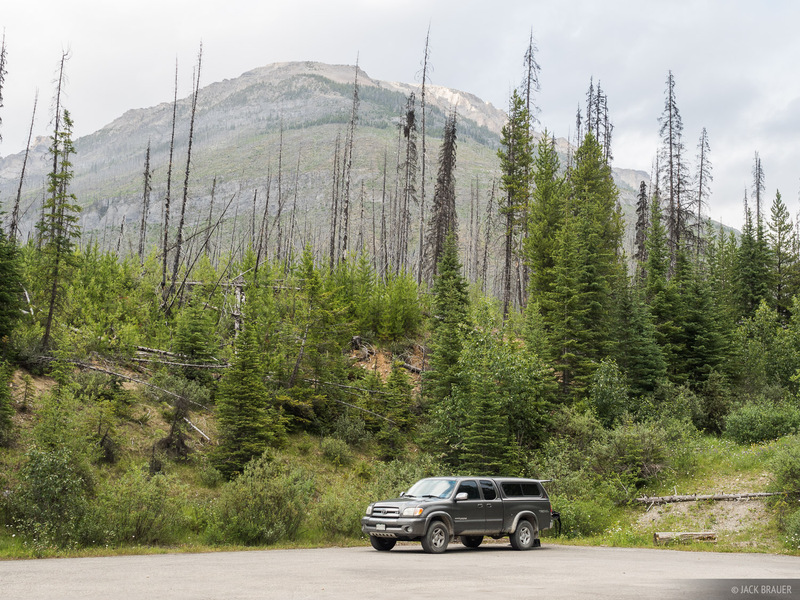 After two nights at Divide Lake, we packed up and moved onwards to Talus Lake, where we spent another two nights. 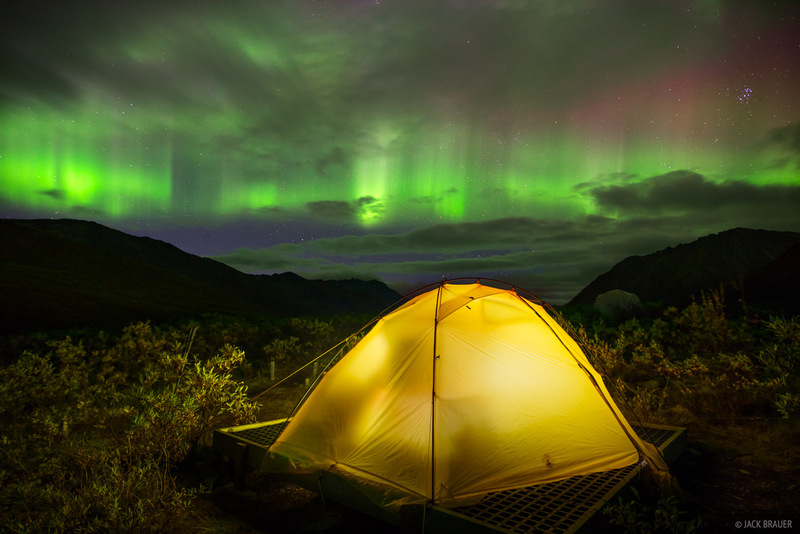 Northern lights above our tent and Mount Monolith (7103 ft. / 2165m). 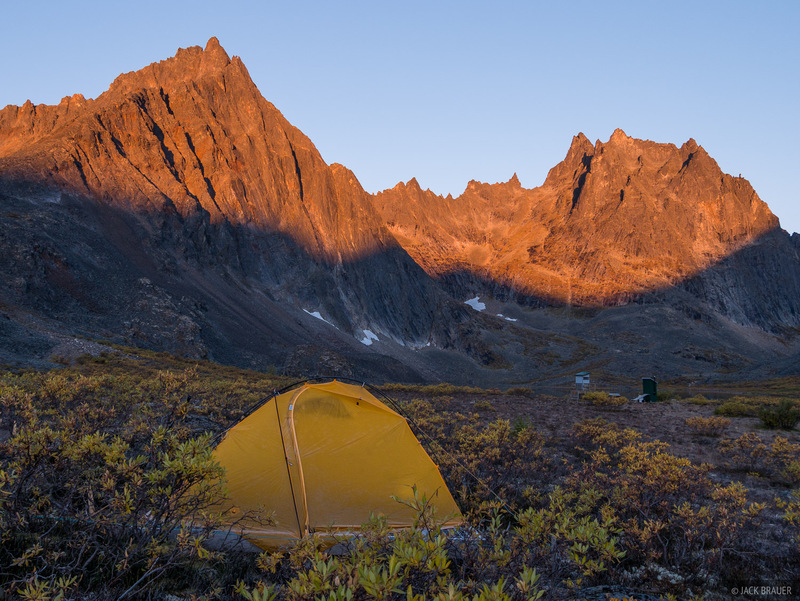 Another view of our tent at Talus Lake, looking towards Tombstone Mountain, the namesake peak of the range. 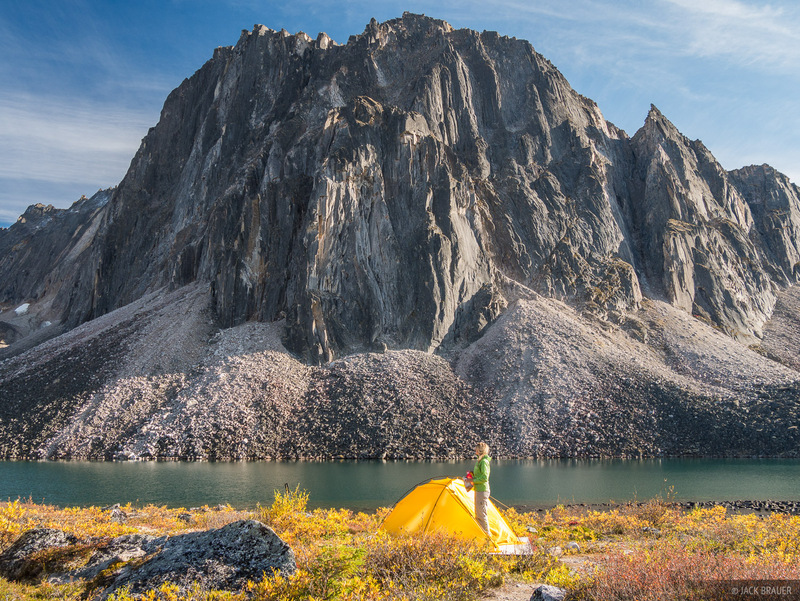 Sunrise light on the peaks above Grizzly Lake. Having spent half the night awake watching the northern lights, I barely managed to drag myself out of the tent long enough to snap this sunrise shot before going back to bed again! 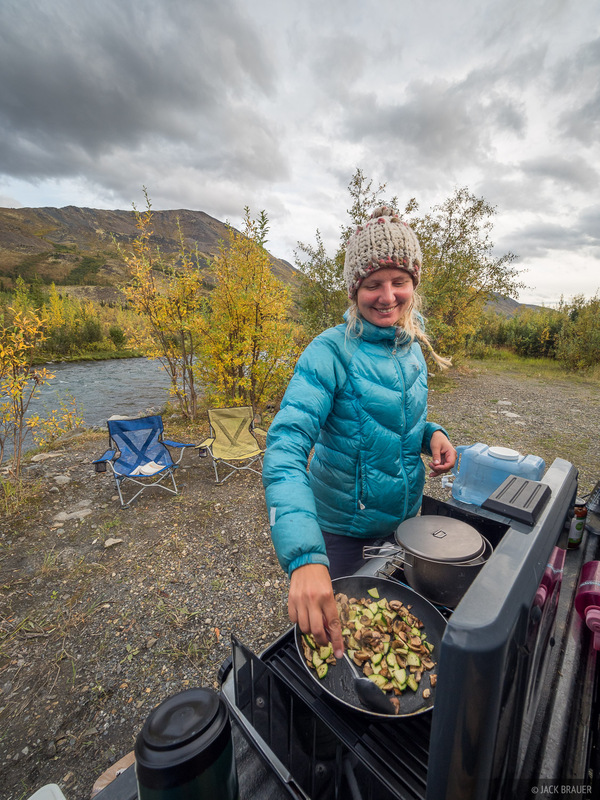 Back from our 7-day backpack trek in the Tombstone Range, we enjoyed coin-showers and a delicious dinner in Dawson, then camped in a campground outside of town where we gazed at the auroras one last time before heading south again. On our way up north we drove the Cassiar Highway route further west; on our way back south we took the more easterly Alcan Highway route. 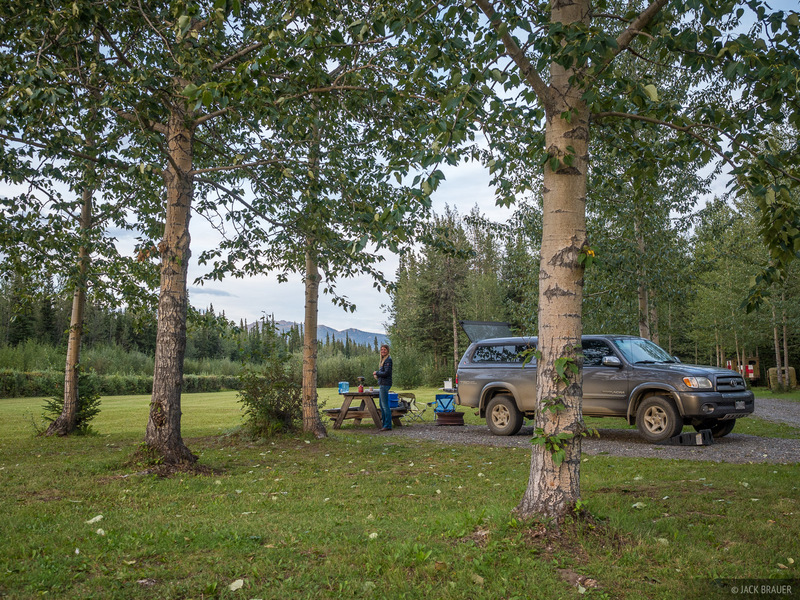 Of course we had to stop at the fabulous Liard Hot Springs for a night! 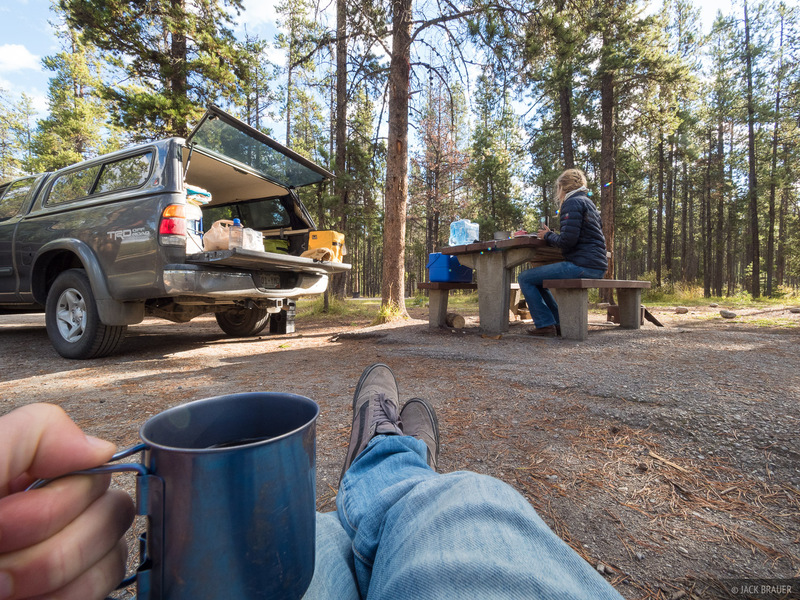 After a fourth grueling day in a row of driving, we stopped at the Charlie Lake campground for a rest. 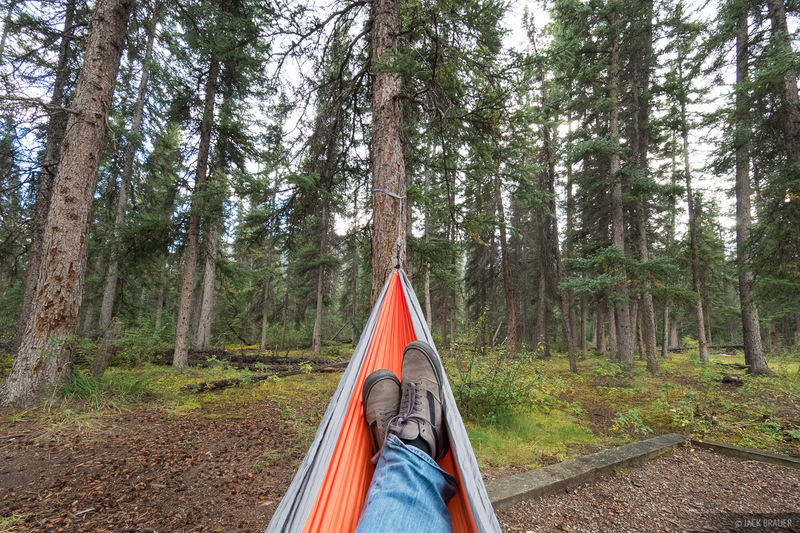 We spent a few days in Jasper taking it easy and stocking up for our next backpack trip. 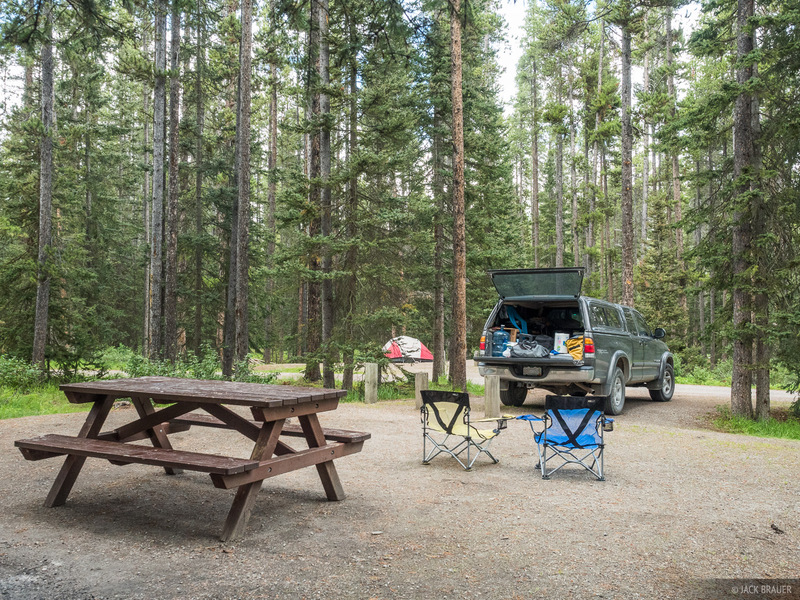 This photo is from Whistlers Campground, an enormous campground that accommodates something like 700+ campsites! 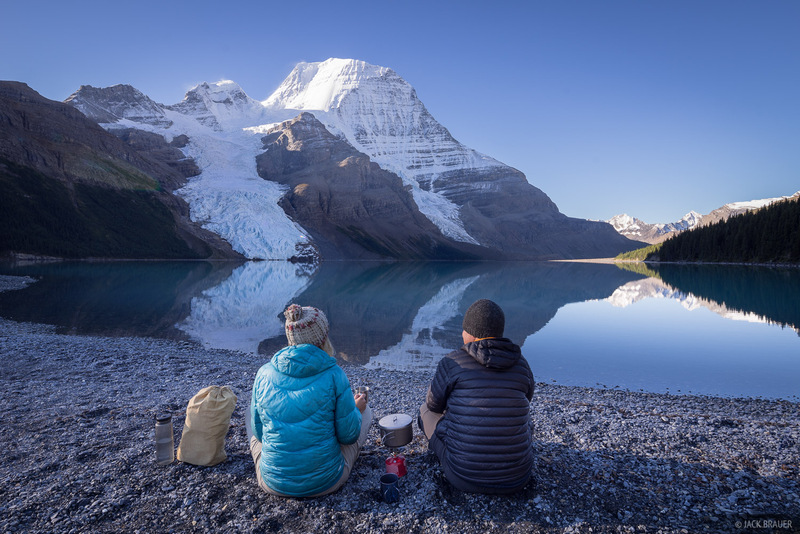 We spent one night at the Robson Meadows Campground before heading out on a 5-day trek to Berg Lake in Mount Robson Provincial Park. 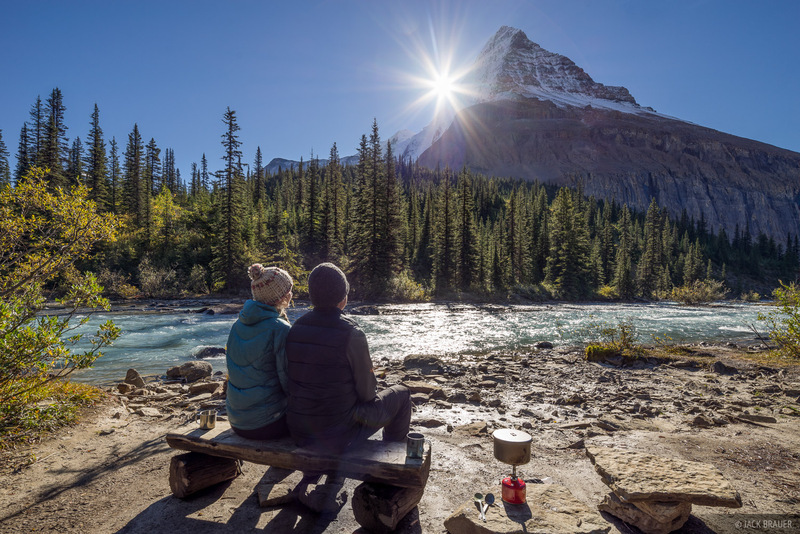 Our campsite "patio" at the Emperor Falls campsite with Mount Robson towering above. 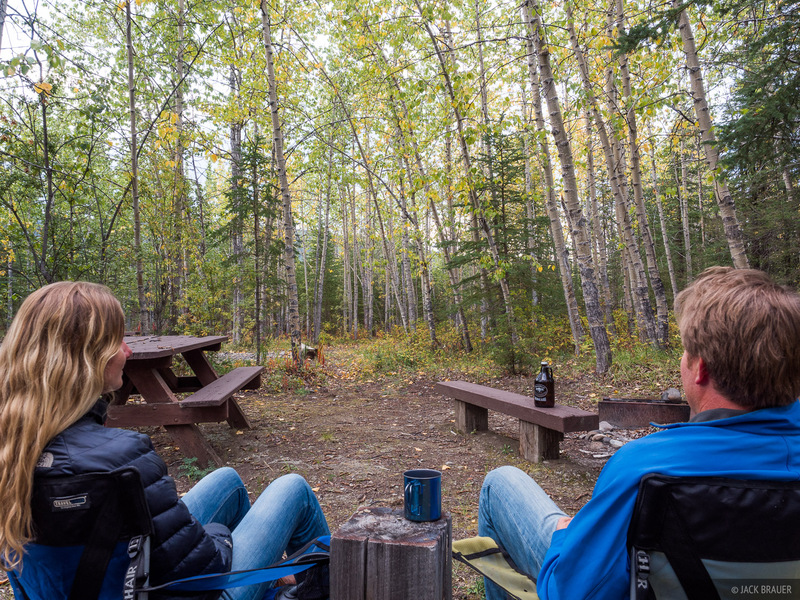 After hiking out from Mount Robson, we spent a night near Jasper at the Wapiti Campground. "Wapiti" means "elk" and sure enough we listened to bugling elk all evening and morning. 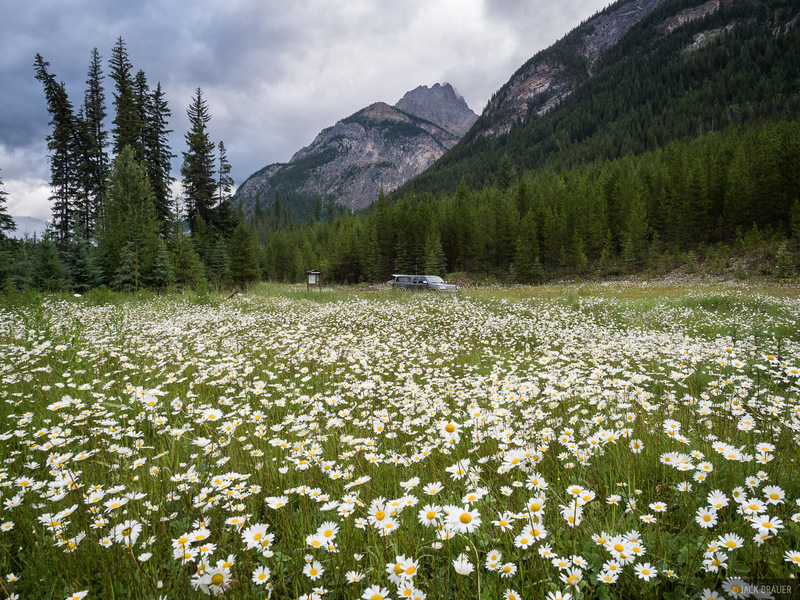 From Jasper we drove back to Banff, where we stayed at the Tunnel Mountain Campground again for three nights before continuing south out of Canada and back to the US. 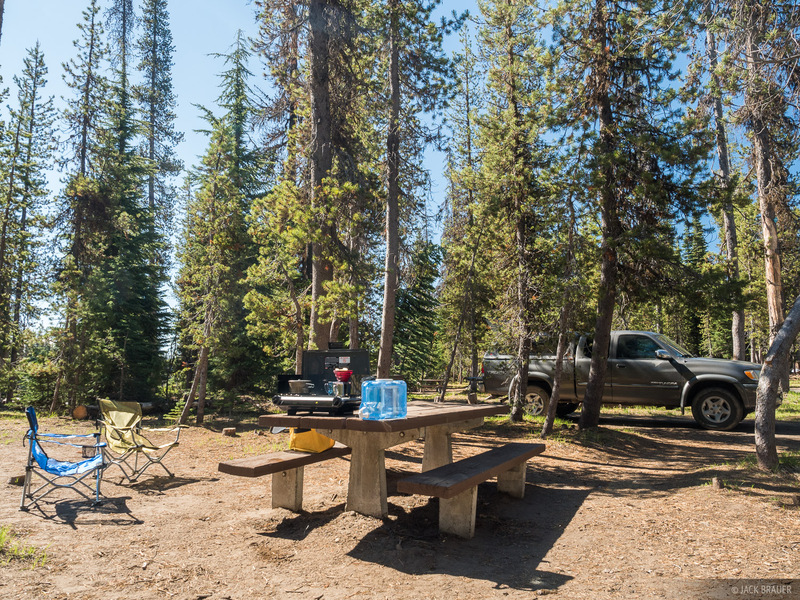 Back in the US, we camped one night at an empty campground at Park Lake. 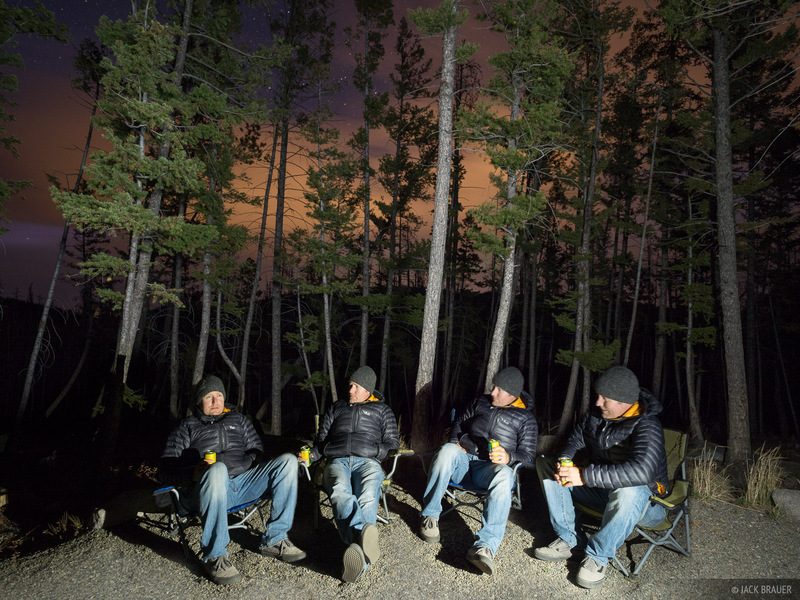 After 90 days of camping, I was starting to talk to myself! If you've made it this far, congratulations! You have an attention span! 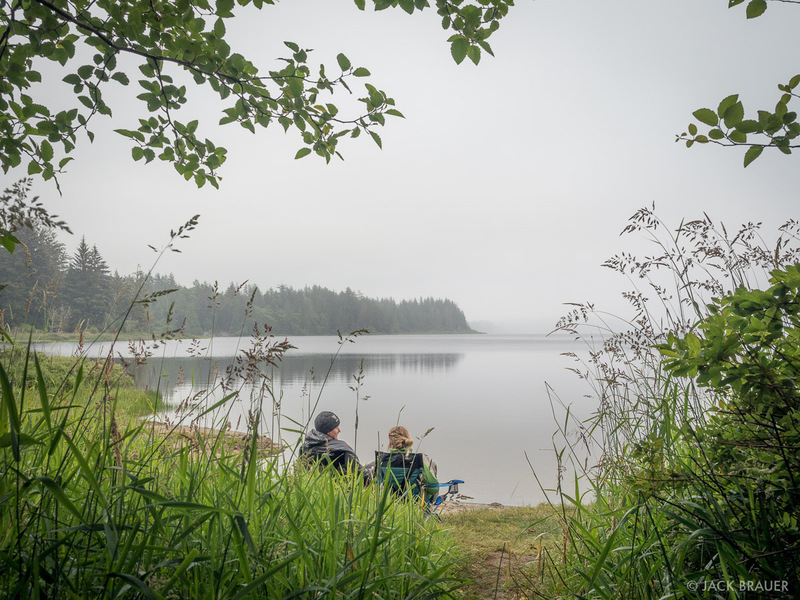 After a summer spent almost entirely camping, there are a few thoughts to share. 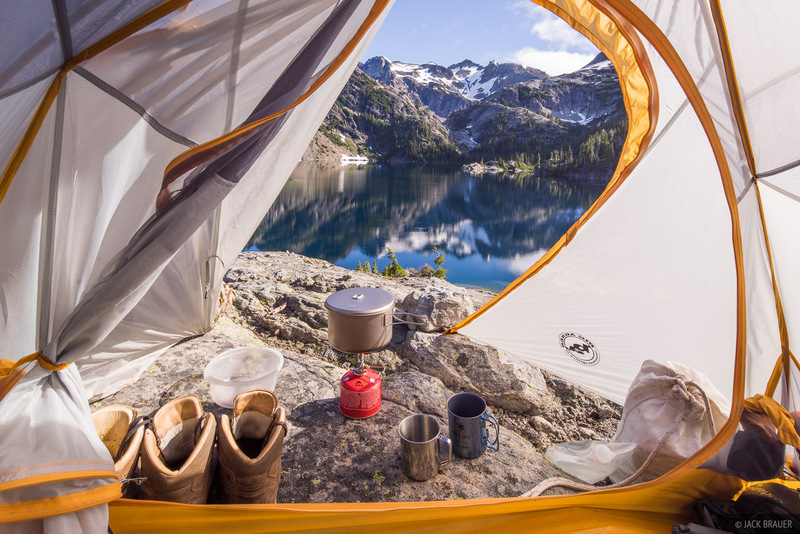 First, if you've looked at all these photos, it should be clear why I love backpacking so much: the places you can camp while backpacking are SO much more spectacular than what's possible when car camping. 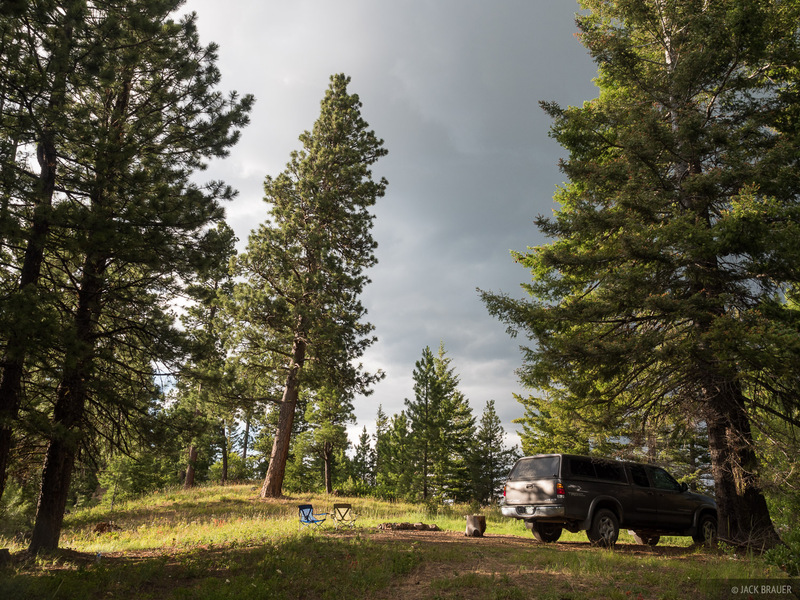 Similarly, when car camping, as usual, we tried to random-camp as much as possible; in other words, we prefer finding random roads or overlooks to camp rather than designated campgrounds. 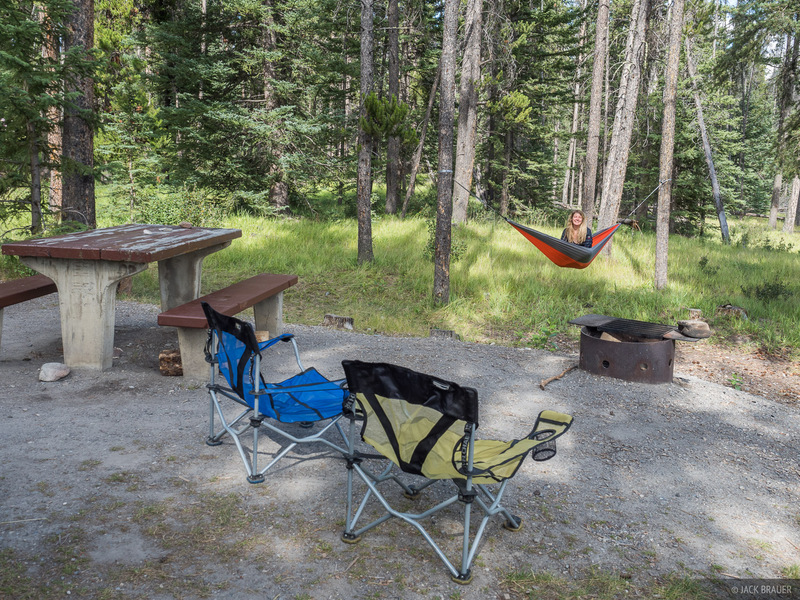 Not only is this cheaper (free), but it's usually more private, quieter, and the spots were usually way more awesome than the typical campground site -- which is also evident in the photos above. 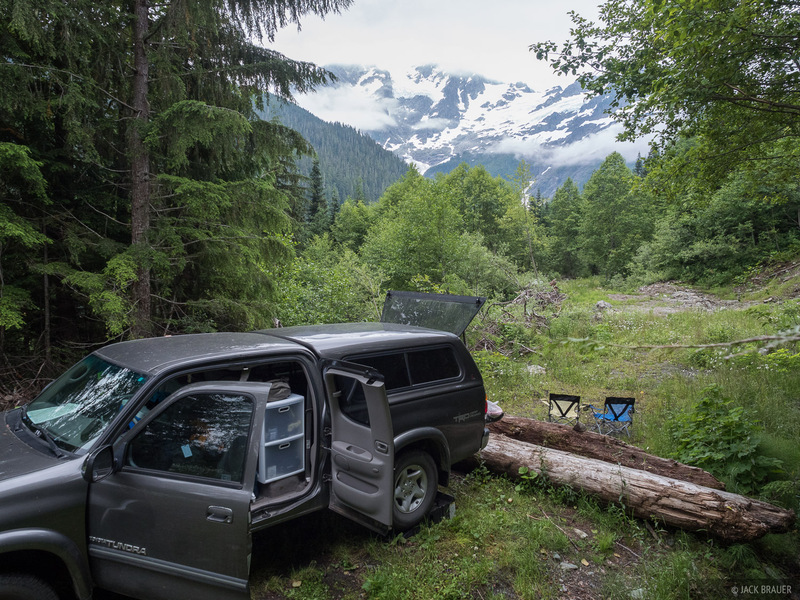 All it takes is some poking around to find lesser used forest roads or side roads; of course a good map and 4WD helps too. Be sure to check out my Best Of 2016 Road Trip gallery to see all my best photos from this trip! Please leave a comment here if you'd like!